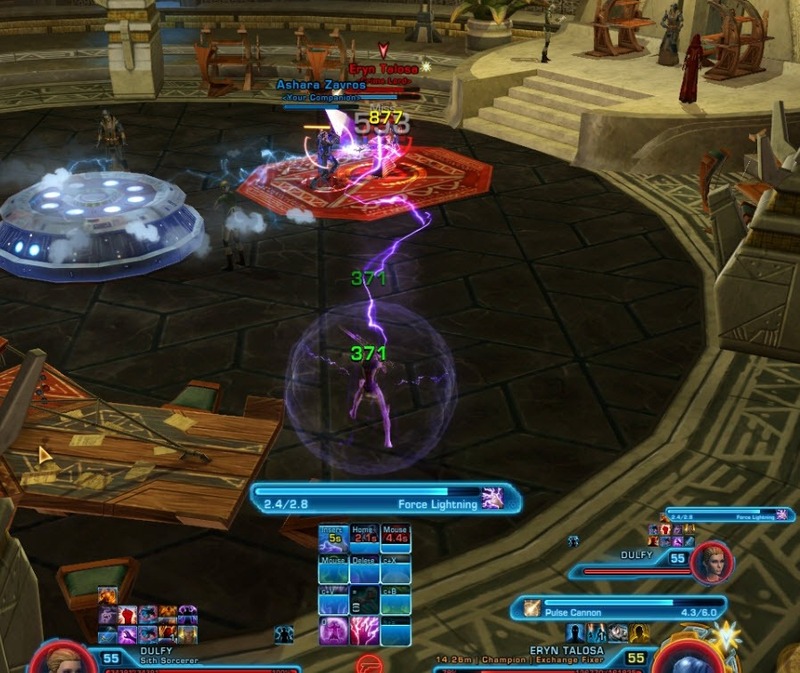 A guide to the SWTOR Bounty Contract Week Kingpin missions. 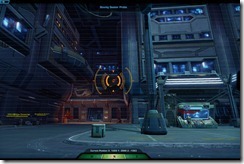 Bounty Contract Week will run be on live servers starting on Aug 13, 2013. 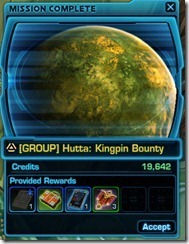 To unlock Kingpin Bounties, you must have 5 Completed Bounty Contract obtained from doing Henchman bounties. These contracts are tradeable so you can mail 5 to one character. 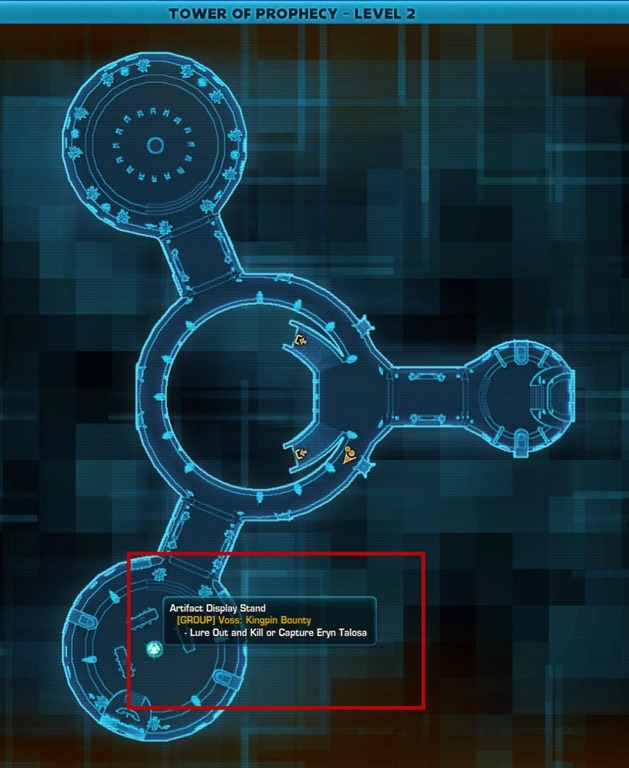 You can then purchase the unlock from the vendor near the BBA mission terminals. 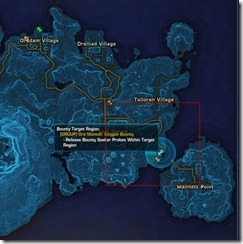 Kingpin missions are weeklies and only one can be done once per day. 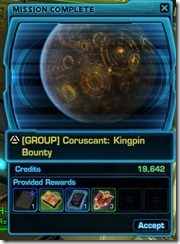 Kingpin bounty unlocks are character specific and does not extend to your entire legacy! 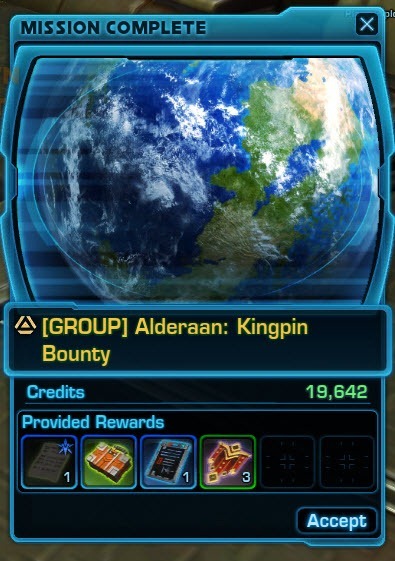 For each Kingpin bounty you unlock on a character, you will also receive a blue rep item as a reward. Like Henchman bounties, you can only do 1 Kingpin Bounty per day. 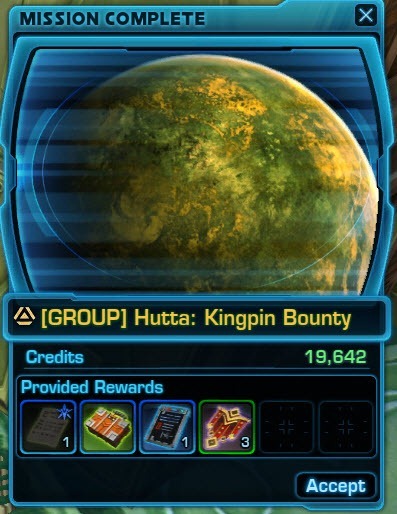 Once you pick up the Kingpin Bounty for that planet, you cannot do the Henchman bounty for the same planet until you complete & turnin that Kingpin Bounty (or you can just pick another planet to do the Henchman bounty). This was done to prevent you from saving time and picking both Kingpin and Henchman bounty for the same planet at the same time. 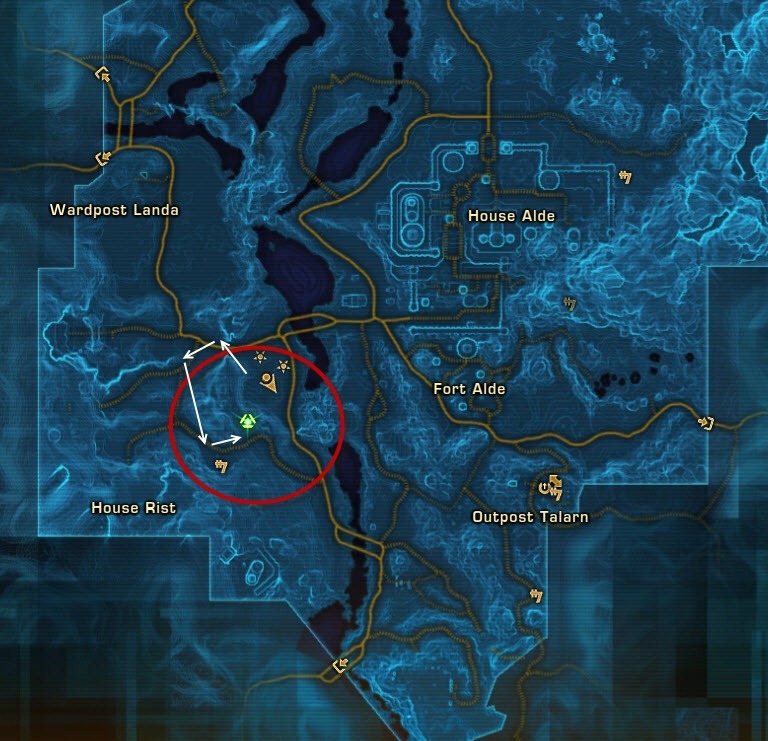 Same location as before, this time Lor’ta will have a different conversation than with the henchman bounties. 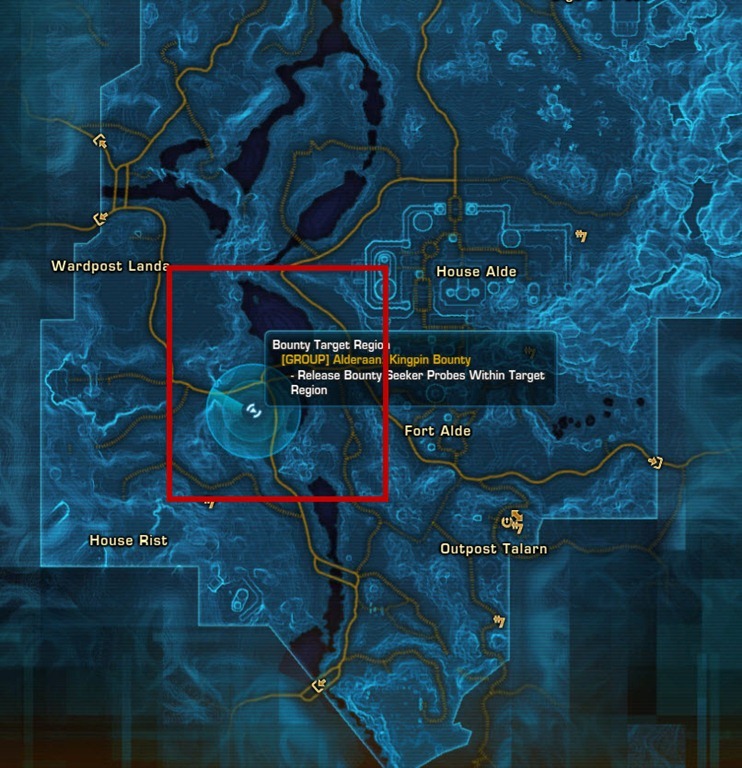 These are not hard to find if you stay in the area and scan. 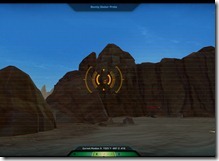 There are more than 5 Seeker Probes available to scan as well. 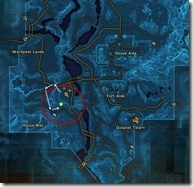 The probe locations are randomized each time. You do not need Macrobinoculars as these will be provided for you. 161k HP, Champion. Immune to stuns. Can be soloed with decent gear. 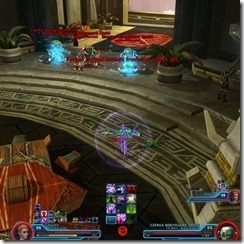 Shock Collar: You make a tasty target for Grov’s pets. He can also punish you for your disobedience. 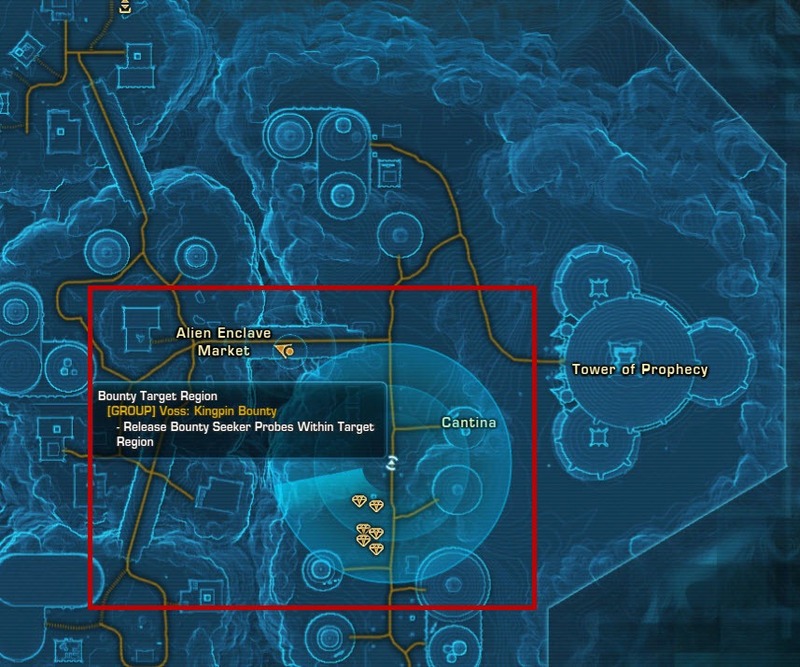 Same location as before, this time Manus will have a different conversation than with the henchman bounties. 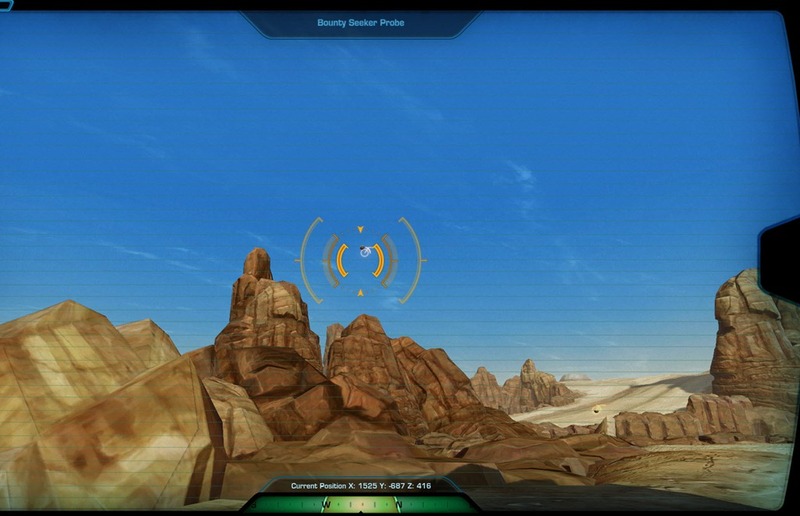 All you need to do is to click on the Seeker Probes you are provided with once you are in the target area and the mission should update to the next step after a few seconds. 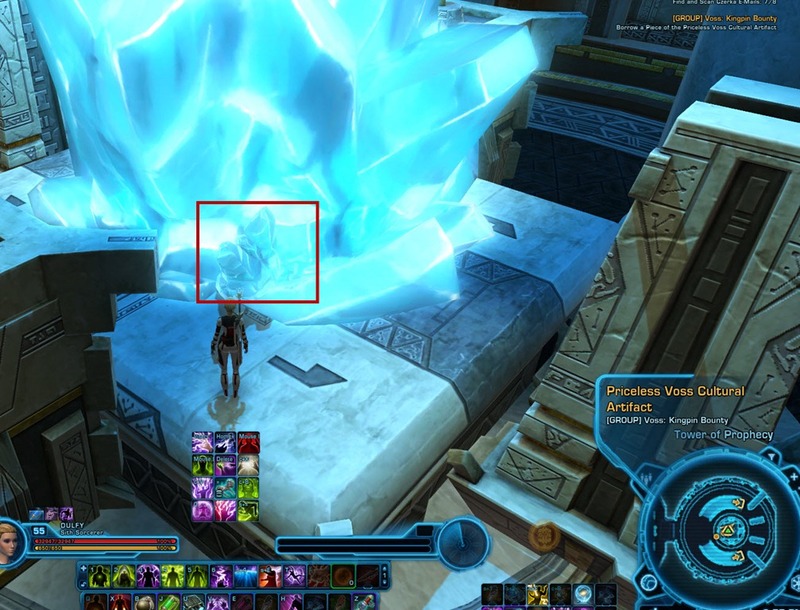 161k HP, inside the Dark Temple and activated by interacting with the Out of Place Artifact. Can be soloed if you are decently geared. 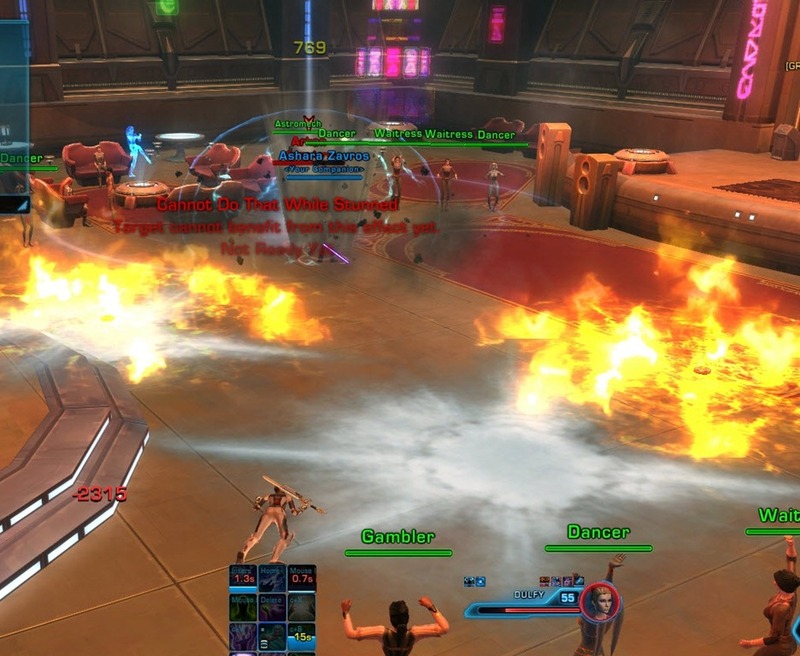 Trok throws out a lot of stuns/CCs, which make this fight fairly annoying. 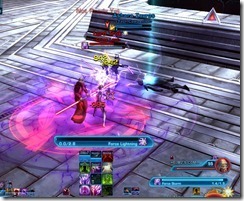 Regular Attack: Spinning Blades (AoE) and Force Storm, move away from it as she is rooted when she uses this ability. Heal: Dark Heal, heals her for about 2%. Debuffs: Periodic AoE damage, stuns/crowd control a lot. Adds: At 50%, Lord Trok will use Force Barrier and is immune to all damage for 60 seconds. 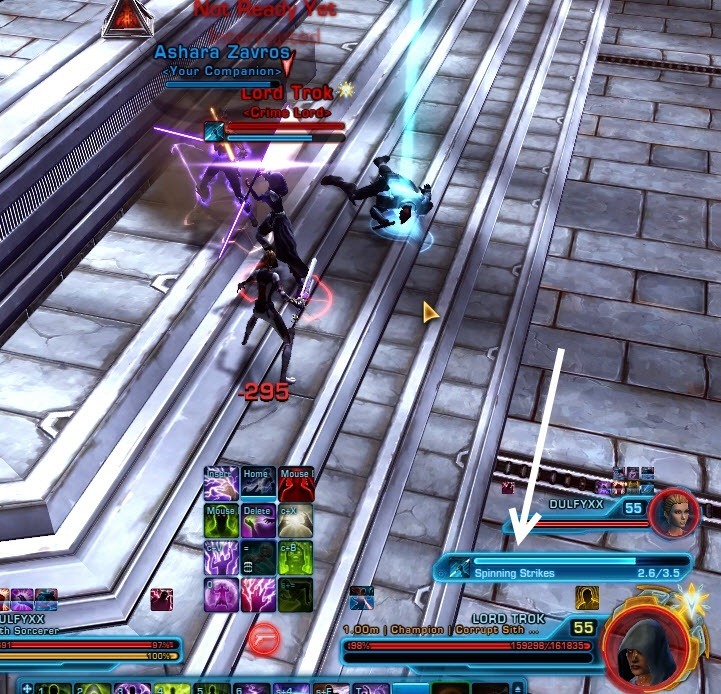 When this happens, a Sith Spawn add joins the fight with 54k HP. Killing the Sith Spawn will end the Force Barrier. 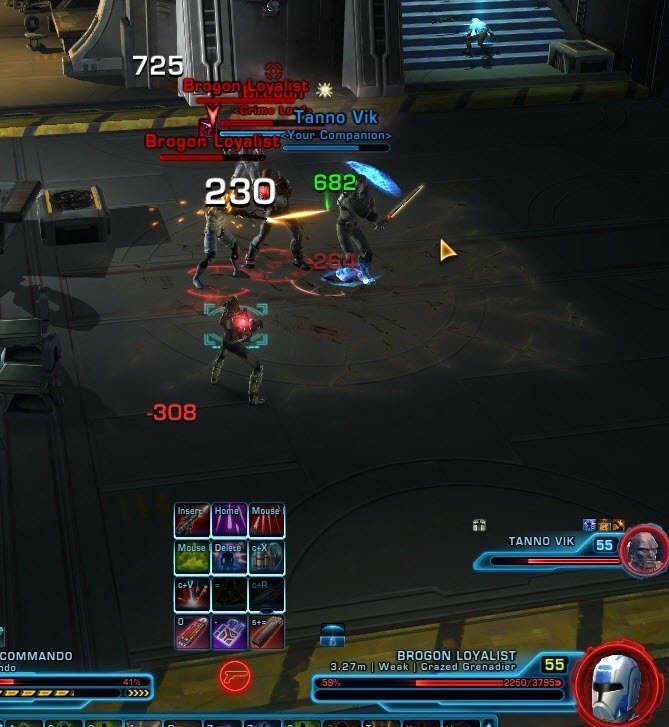 If you fail to kill the Sith Spawn after 60 seconds, Lord Trok will join the fight. 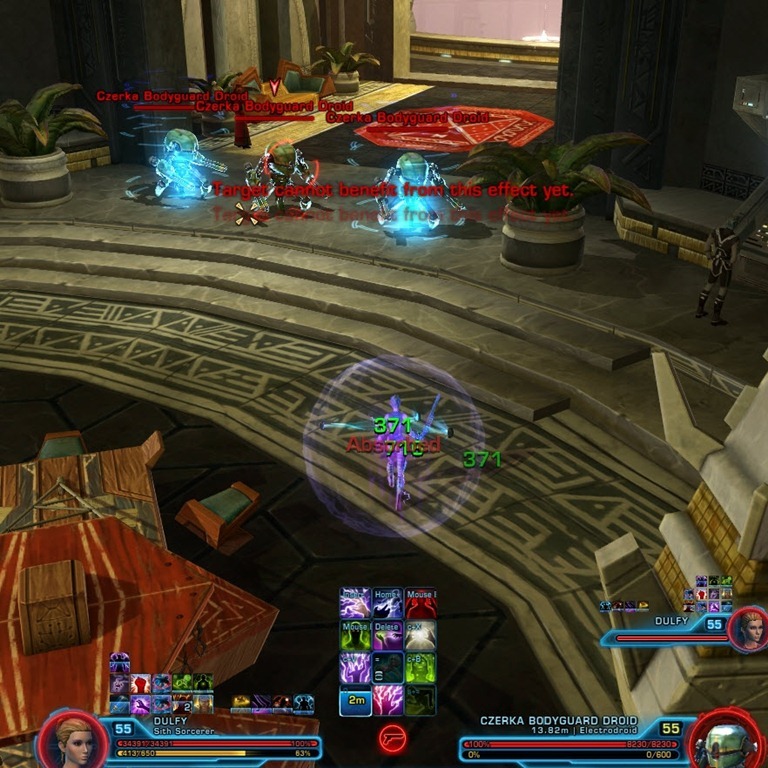 Same location as before, this time Otheros will have a different conversation than with the henchman bounties. 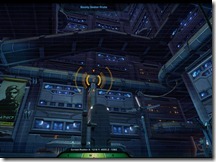 161k HP, inside the Slipping Slope Cantina in Lower Promenade. 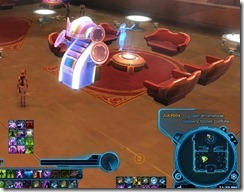 Activated by interacting with this Jukebox inside the cantina. 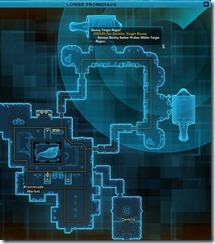 Has a number of moves that can freeze you briefly and put fire on the ground that you will need to avoid. Can be soloed if you are decently geared. 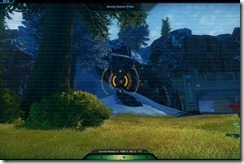 Jetpacking: Arkan will jump in the air for 10 seconds and throw down Cryo grenades and fire mines. If you get caught in them, you will take damage and/or get knocked to the ground. 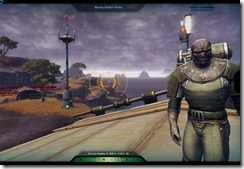 He is immune to ballistic damage and controlling effects while he is up in the air. It is best to keep moving during this maneuver to reduce the damage you take. When Arkan jumps down from Jetpacking, he will do a massive knockback so don’t stand next to him. Cryo Beam: Beam of cryo that will freeze you for a few seconds at the end of the cast. 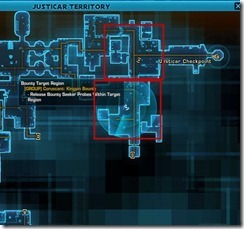 Stealth: Periodically during the fight, Arkan will disappear and all the patrons will gather towards the spot where he disappeared. 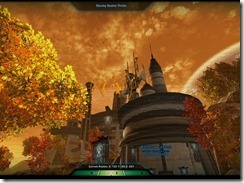 This is a chance for you to recharge and gain some of the resources back. When he reappears, he will spawn clones of himself that should be killed quickly before they do significant damages to you. 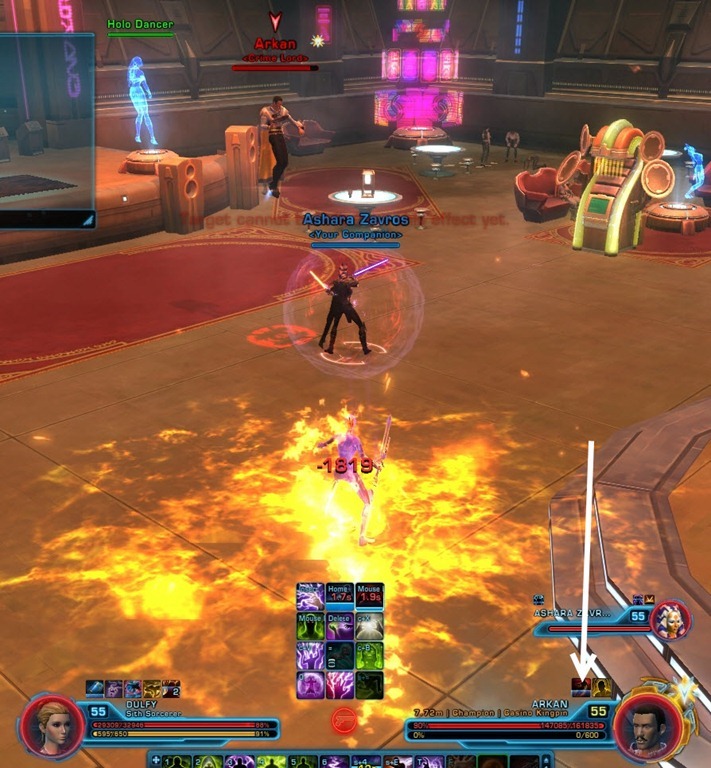 Healing: Usually at the start of the Heat Beam cast, Arkan will gain 10 stacks of Kolto Shell, which heals him if he takes damage. There isn’t much you can do to avoid it and the healing is minimal so you can usually just burn through it. 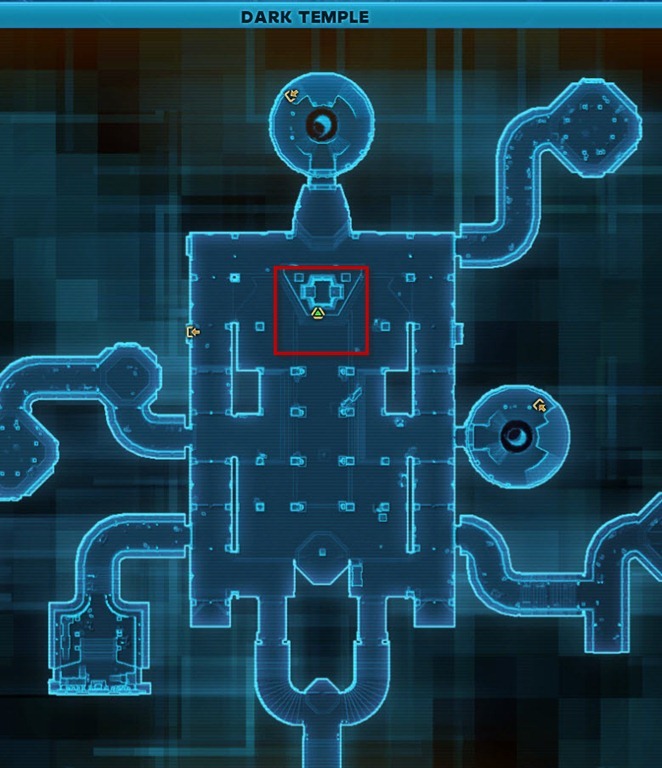 Same location as before, this time Meerko will have a different conversation than with the henchman bounties. 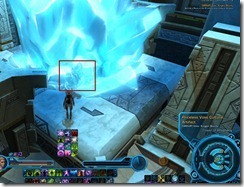 161k HP, activated by interacting with the little pad on the box that says Call for Pickup. 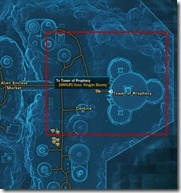 Can be soloed if in decent gear, bring a healer companion if possible. Hit quite hard so make sure to have a healer companion if you are DPS/tank. 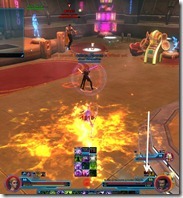 Also have a couple of attacks that knock you into the air and a red circle rocket attack that you should avoid (No cast time). Don’t fight near the ledge as the knock up can punt you off the cliff. 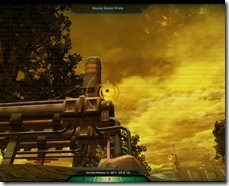 Flechette Rounds – all basic attacks do internal bleeding damage. Explosive Rounds – all basic attacks do additional explosive damage. Missile Rounds – casts the red circle mentioned above. Cryo Rounds – all basic attacks slow you down. 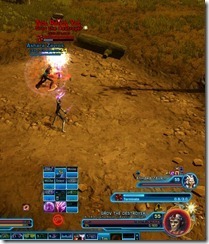 Adds: Mandalorian Bandits with 24K HP summoned at at a timer. These adds can be crowded controlled but some of them spawn quite close to the ledge making them valuable for a knockback. 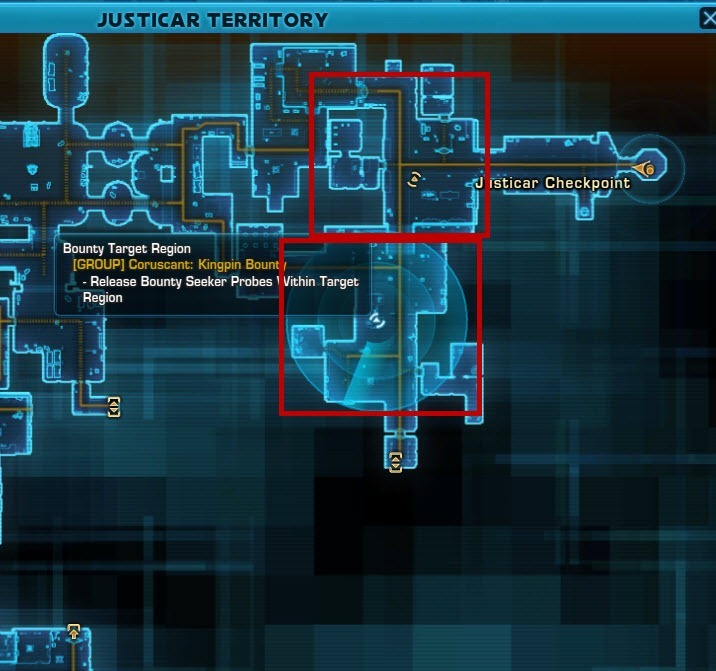 Same location as before, this time Dariana will have a different conversation than with the henchman bounties. 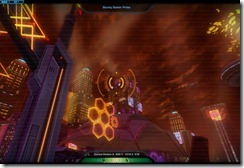 161k HP, summoned by interacting with a crashed shuttle that you will need to go around from the scanning area to reach. 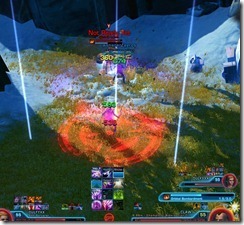 Can be soloed but you will likely need a healer companion if you are tank/DPS due to the high damage output from Claw and his adds. 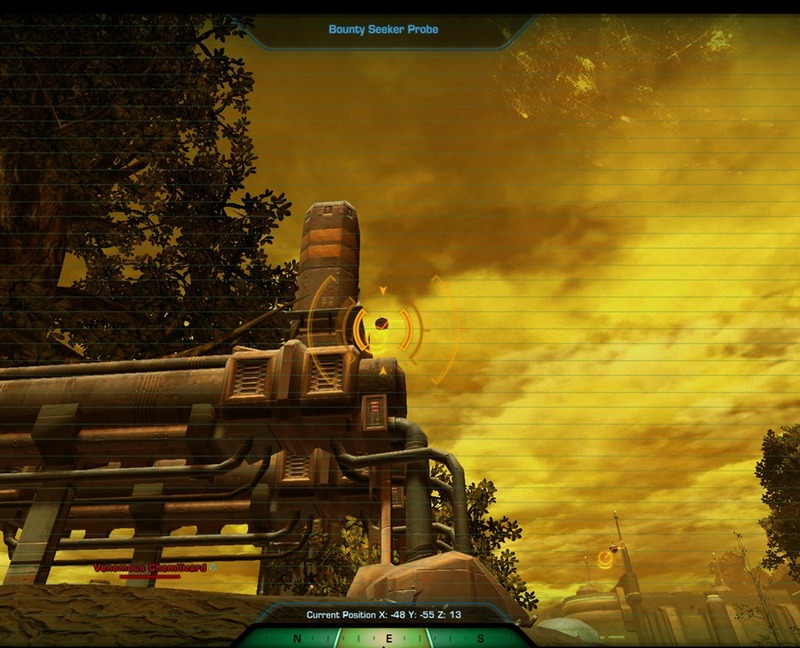 Has a number of attacks typical of Gunslingers, you will want to avoid his Orbital Bombardment attack, which can hurt quite a bit. Claw has a special move where he will grapple you to him and then drop a red fire circle directly on top of you before teleporting to somewhere else. Summons two Hooligan Outcast adds with around 9k HP. They will heal Claw if not killed quickly. 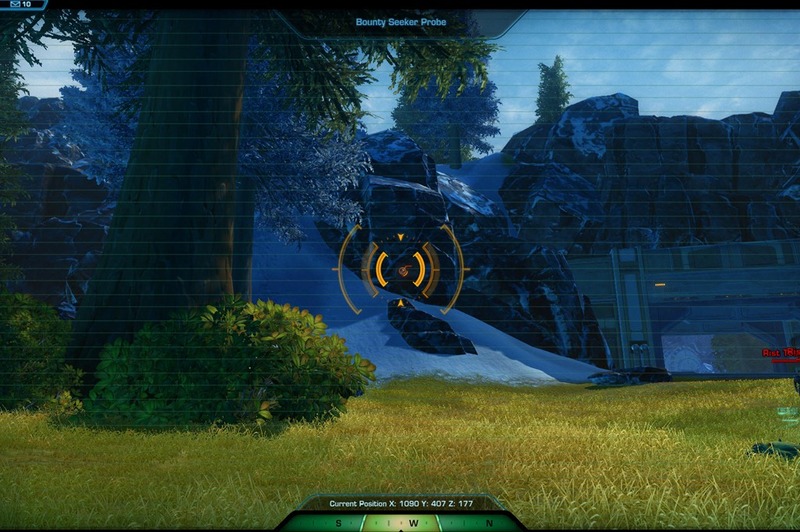 The pair of adds spawn based on a timer (appears to be every 34 seconds). 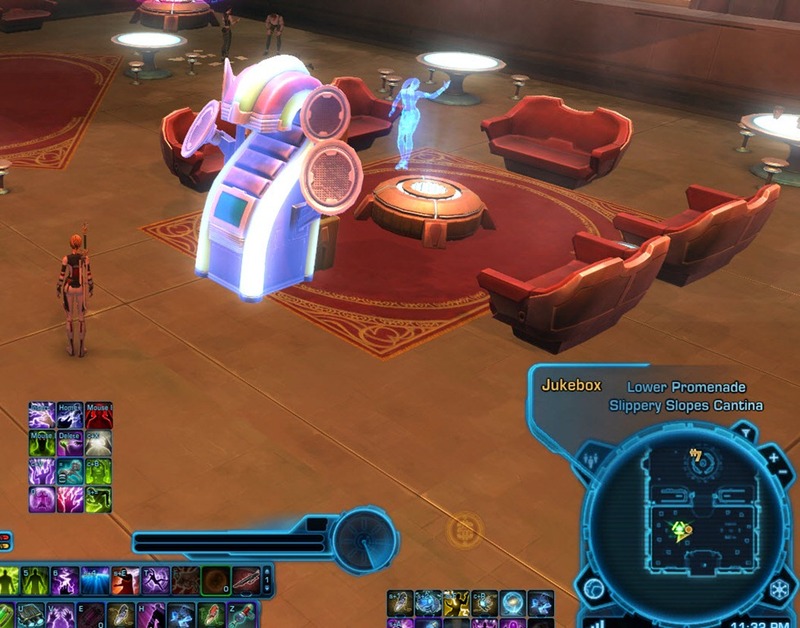 Same location as before, this time Sama Zo will have a different conversation than with the henchman bounties. 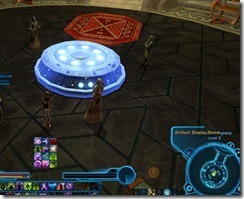 You will need to jump up on the huge crystal in the middle of the Tower of Prophecy and then click on this small crystal to get the artifact. 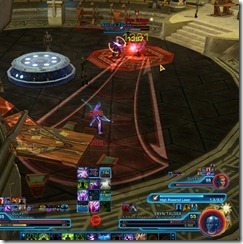 161k HP, summoned by interacting with the Artifact Display Stand on the second floor of the Tower of Prophecy. Can be soloed but might be hard without a healer companion. Eryn will slow you quite a lot, which makes it harder to avoid some of her abilities that are hard hitting. Eryn constantly apply a slow debuff to her target, which make avoiding her attacks quite difficult. She also have a debuff that prevent you from using high speed movement abilities (i..e Force Speed). 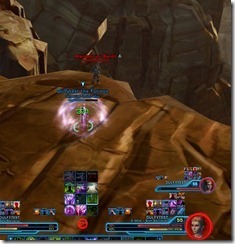 The slow and the debuff tend to come together, making it a deadly combo. She also have a Reflect ability, if you see her casting reflect shield or something, stop attacking so you don’t kill yourself! Pulse Cannon is her conal attack. It is quite easy to avoid as long you are standing away from her. Doesn’t do a lot of damage so it is a non-issue for most melee players as well. At 3 stacks of her Shoulder Cannon buff, she will drop a red circle on your feet, which will cause knockdown and quite a bit of damage if you don’t run out of it. 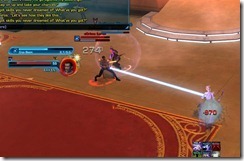 Eryn’s signature move is High Powered Laser, which is a telegraphed conal attack that does ridiculously amount of damage and cause a knockdown. 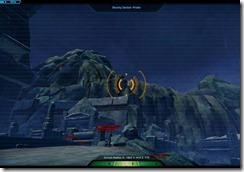 It is advised to try move out of it (use stun breakers to break out of the slow) or use defensive cooldowns if you are unable to. 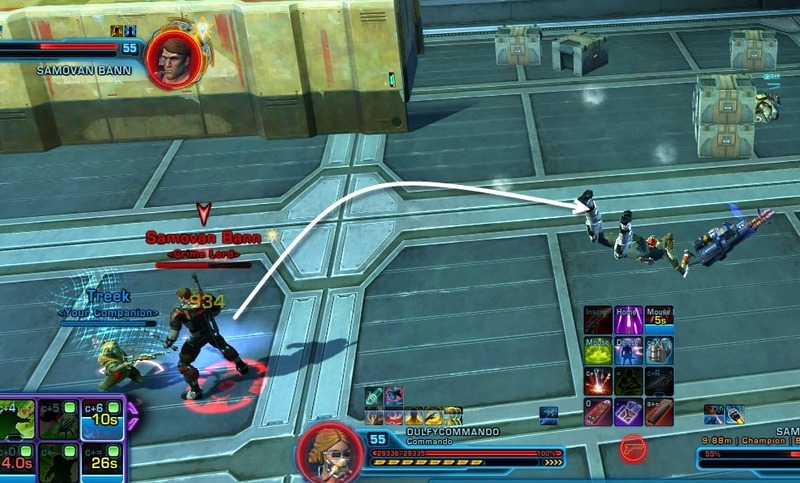 The conal is longer than the graphic so you may get hit by it even if you are not inside it. At 50%, she will summon 3 droids who will rush to the entrance of the room and fire on you. 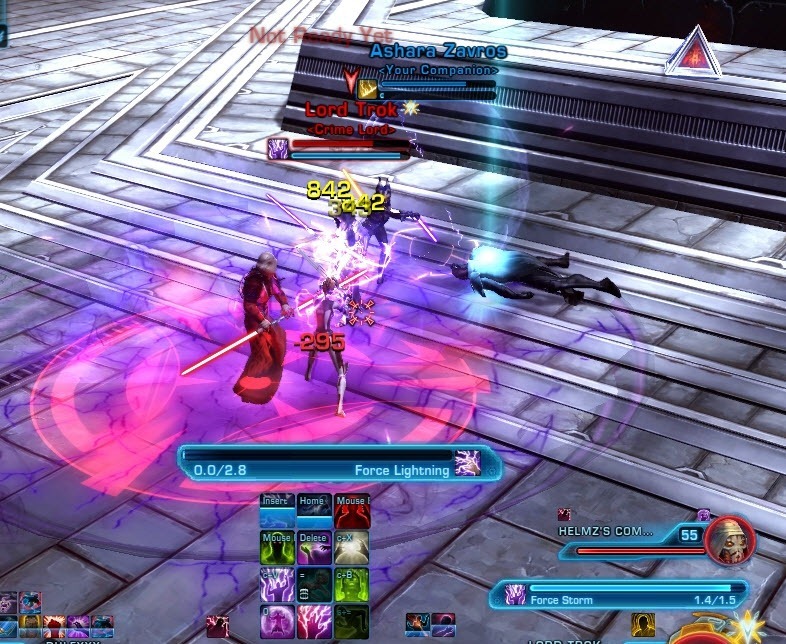 They have ~8k HP each and don’t move so you can AoE them down while staying as far from Eryn as possible to avoid her High Powered Laser attack. 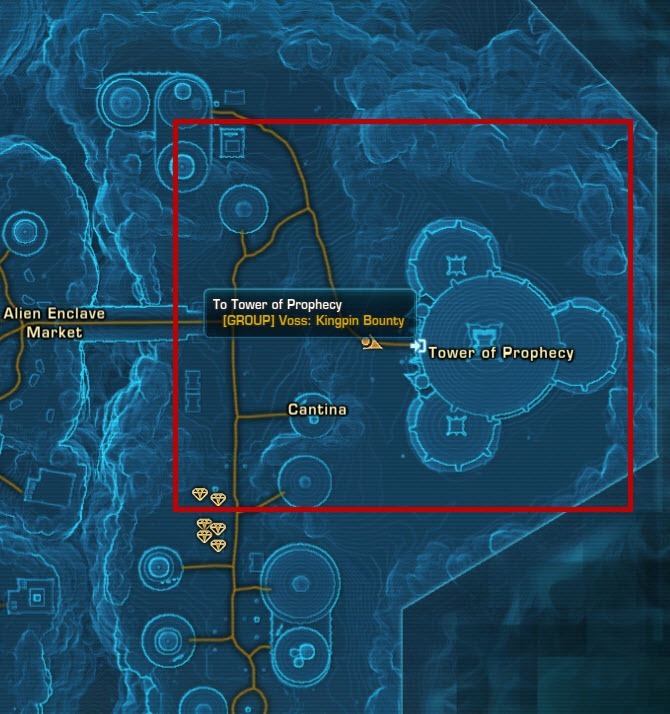 Same location as before, this time Ariavos will have a different conversation than with the henchman bounties. 161k HP, activated by interacting with the workshop inside the building.. Can be soloed if in decent gear, bring a healer companion if possible. 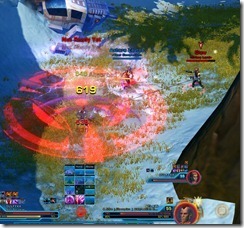 Regular attacks are Full Auto and Ambush. Mix between a trooper and a wolverine with a knockback kick. 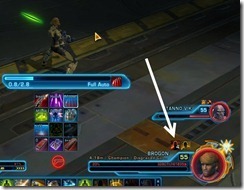 Adds: Two Brogon Loyalist spawns frequently (on a timer) with around 4k HP each. 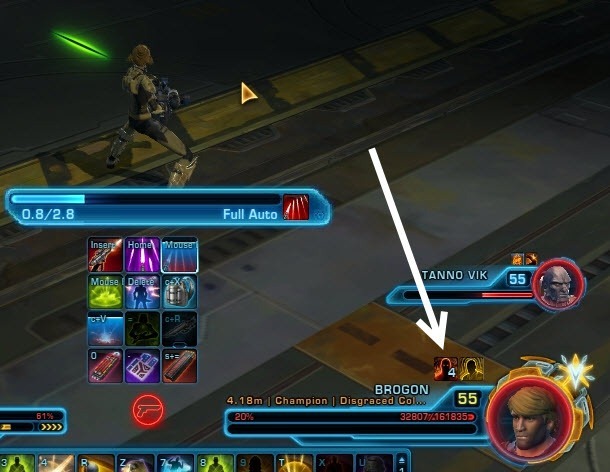 If they are not killed quickly, they will increase Brogon’s rage stacks by 2, which give him 20% more damage and a reduction in ability cooldowns. 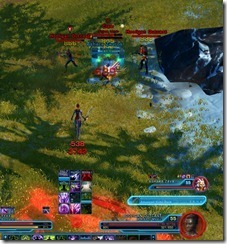 The stacks are reduced to 1 when Brogon uses Ambush. 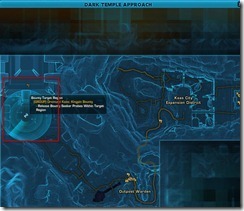 Same location as before, this time Tam Daral will have a different conversation than with the henchman bounties. 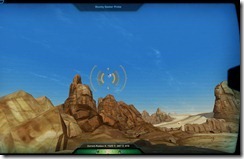 All you need to do is to click on the Seeker Probes you are provided with once you are in the target area and the mission should update to the next step after a few seconds. 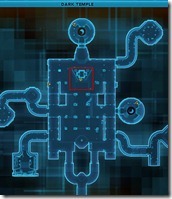 Note that there are two areas where you can deploy the probes, if one area doesn’t work, try the other. 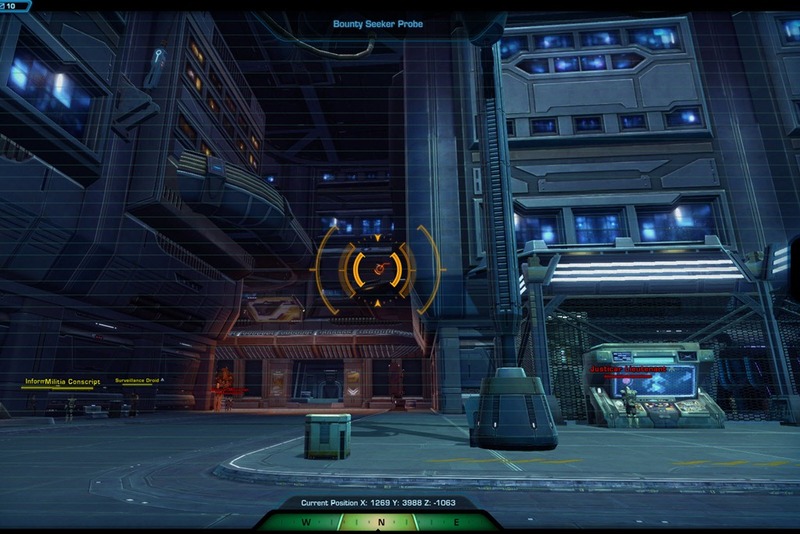 161k HP, activated by interacting with the Sturdy Looking Crates in the marked location. 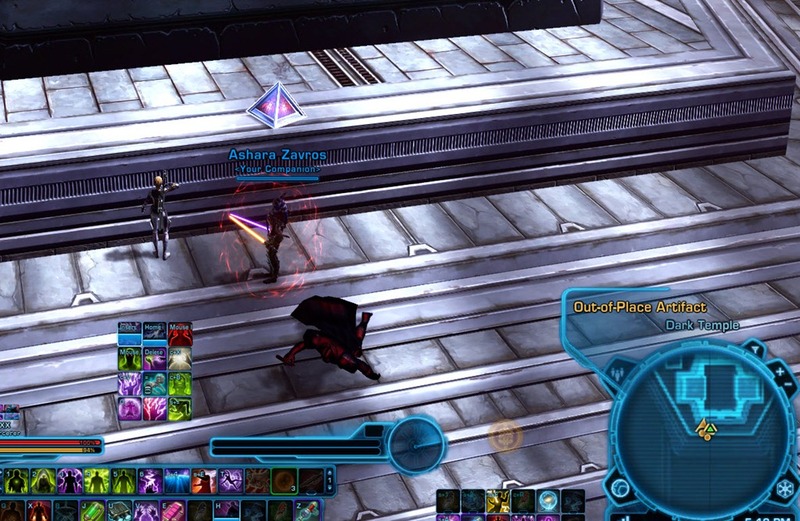 Can be soloed if you are decently geared with a good healer or tank companion. 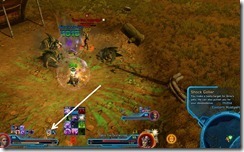 Hits like a truck and spawn adds that also hit hard so either have a tank companion for healers or bring a geared out healer companion for tank/DPS players. Samovan Bann is mostly a melee character and doesn’t have a lot of abilities except for his grapple and knockback combo which is fairly annoying and frequent. It can interrupt your abilities and knock you off the ledge if you are not careful. 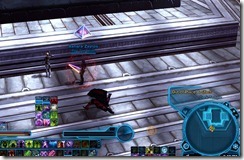 His other attack with a cast bar is Ravage, which can be interrupted. 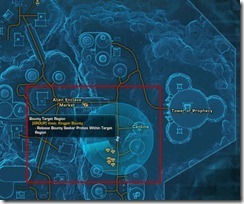 He will spawn 3 Black Sun Gang Member adds on a timer (first set spawns at 89% but rest seems to be on a timer of 1-1.5 minutes). They have around 7.6k HP and tend to spawn on the ledge. 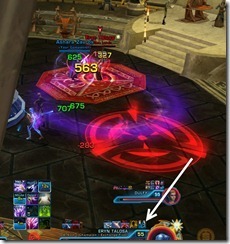 This allow to use knockback to get rid at least of one add. Sometimes you may get lucky and your knockback can get more than one. 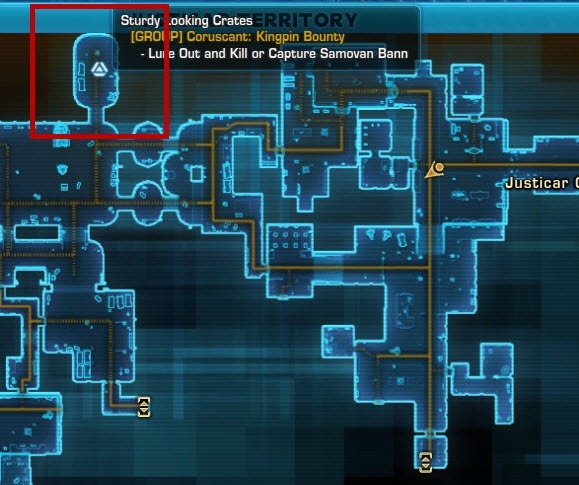 That is quick, a guide before we even get the event. 🙂 nice work. One question: there is conflicting info in the post: this one says it starts on August 6th, the other posts say August 13th. Oops, should be Aug 13. 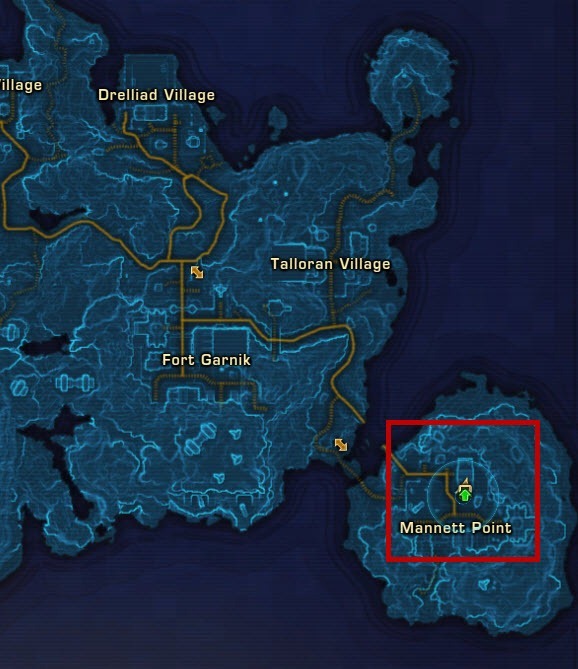 Aug 6 is when patch 2.3 lands but this event doesn’t start until a week later. Character unlock and yes once unlocked you can do it many many times. Does these kingpins have the same health no matter what you’re level is? 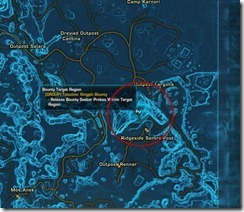 Since Req level on Hutta is level 15 while the npc have 161k health. They scale, the HP values I listed are for L55 characters. 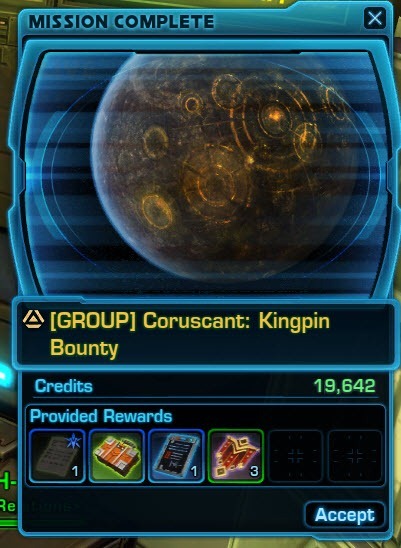 One question: to get the achievement for unlocking all kingpin bounties in 1 week you `ll need 6 chars from which 2 must be on the opposite faction and at least lvl 15, right?? Yes you will need 6 characters. Assuming this event goes live on next wed as they have said, by Sunday you will unlock the first kingpins on 6 of your chars. You will need then to keep doing kingpin and henchman on 2 of the any 6 chars you have to unlock the last 2 which should be the tuesday of the week after. Thank you for your answer Dulfy. 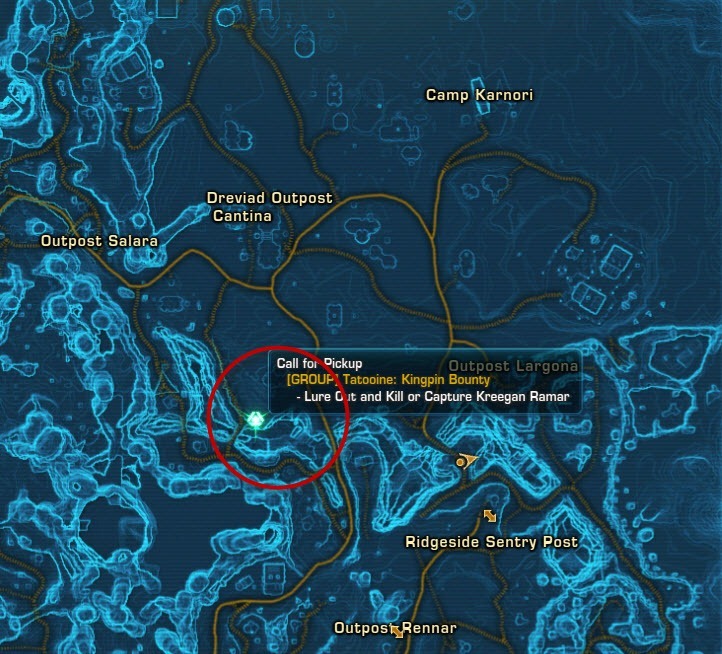 I have one more question about the Kingpins: How long did it take you to capture / kill them? 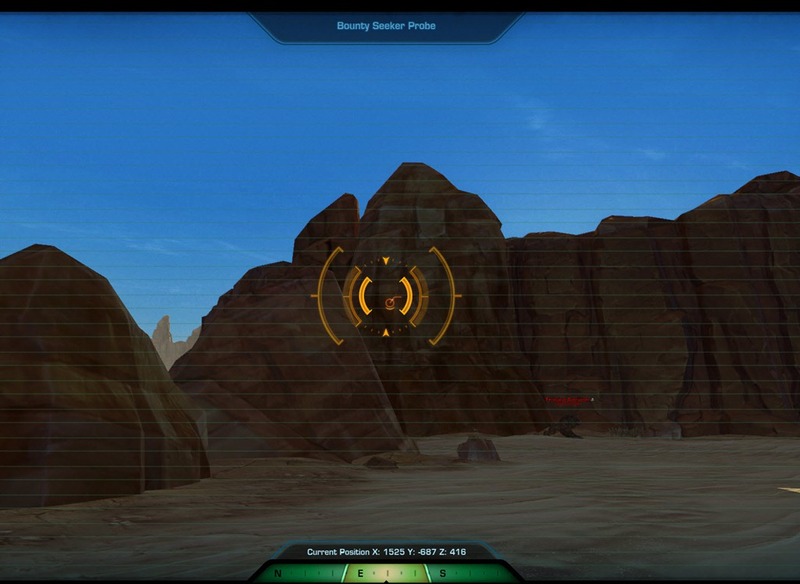 Considering that you need to scan the seeker probes and fight them. Not long, maybe 15 mins in total but could be longer on live since there will be alot more people thus gotta wait etc. 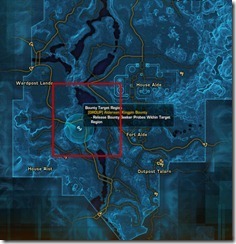 So are the kingpins instanced or are they just activated in the open world? Also, do you know how hard they will be for a non 55? 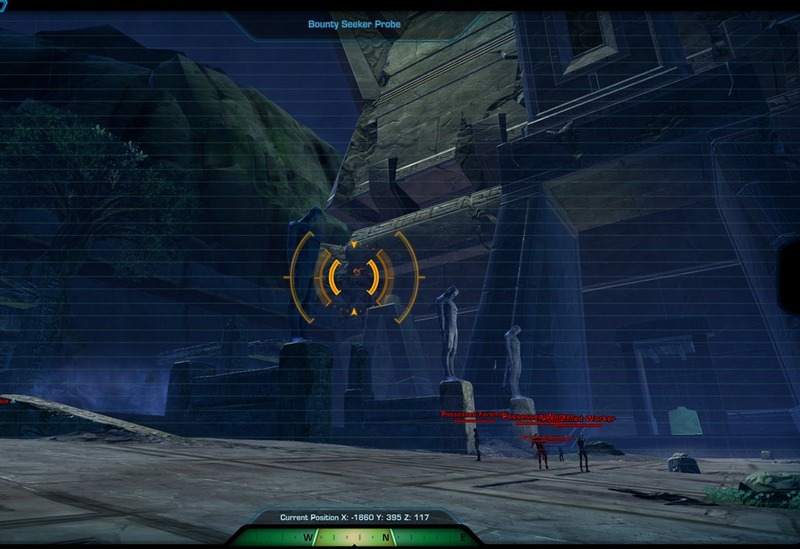 Not instanced (i.e. prepare to wait in line) and they scale to your level. Some of them are pretty tough at 55 (i.e. 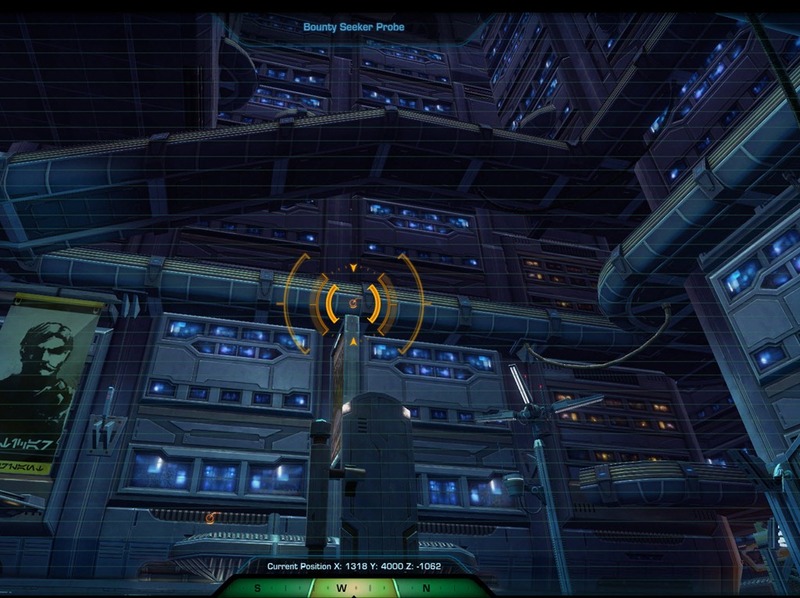 Dromund Kas/Ord Mantell) but not sure how they would scale to non-55s though. When you say some of these can be solo’ed if you’re decently geared, what level of gear are you thinking? Kell Dragon? Or something more like Black Mkt or Ark? Cool – thank you very much for everything! Love your site! So are there no more purple rep tokens? 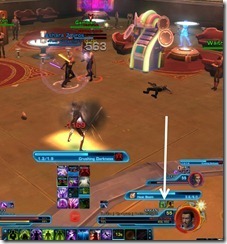 Yes, sadly that means, I believe, that it will take an extra week to max out BBA rep.
Eryn Talosa has some kind of reflect ability. 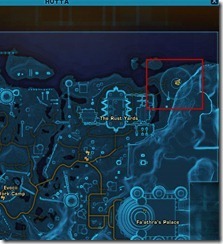 Didn’t get details on it during the fight, was a little preoccupied, but I didn’t see that mentioned in the guide. 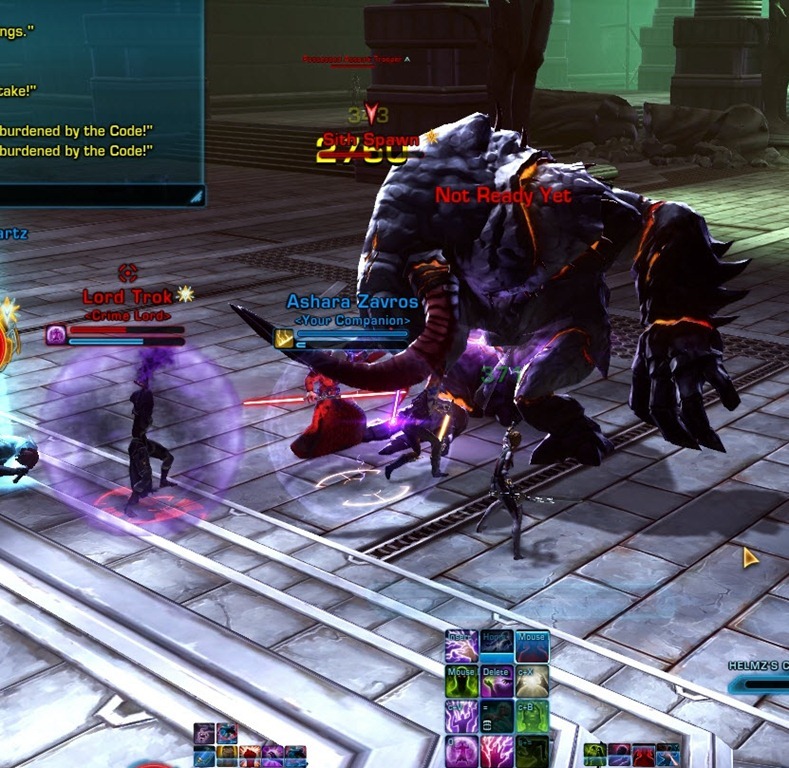 Soloed Grov the Destroyer (Hutta) as a level 20 sorcerer (corruption). 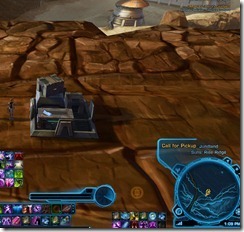 Standard levelling gear. Used Heroic moment to secure the kill, but overall wasn’t very hard. Posting as a reference point for others. Might be a dumb question but can you a) do these in a group, and b) will the whole group get credit? Yeah you can do them in a group and everyone gets credit, keep in mind everyone gets either kill or capture depending on what you choose. Why do you need 6 characters of which 2 have to be of the opposite faction? 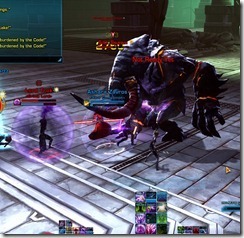 What if you’re in a group with members of different levels – does the boss scale to the highest or lowest level? 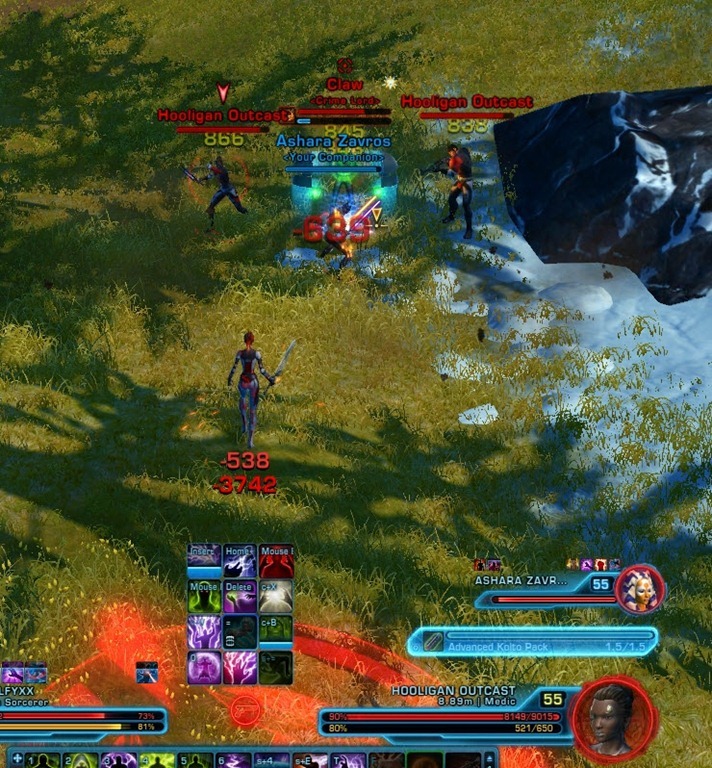 If you’re grouping with a difference in level, your best best is for the lower level person to be a healer, or have a healing companion, since it only takes a few levels to render any damage you might do useless. Anyone know how much hp kingpin boss at lvl15 have? me they should have made the rewards greater for the Kingpin contracts. Opinions? For anyone that does Achievements, you wouldn’t be able to complete even half of the achievements if you don’t do the Kingpin contracts. 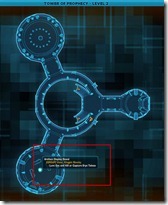 Also, you don’t know what additional quests could be added down the line….it’s a monthly recurring event. So if they add something beyond Kingpin in the future or up the rewards for Kingpin quests and you’ve never unlocked any Kingpin quests, you could be far behind. Is there more to these rewards? 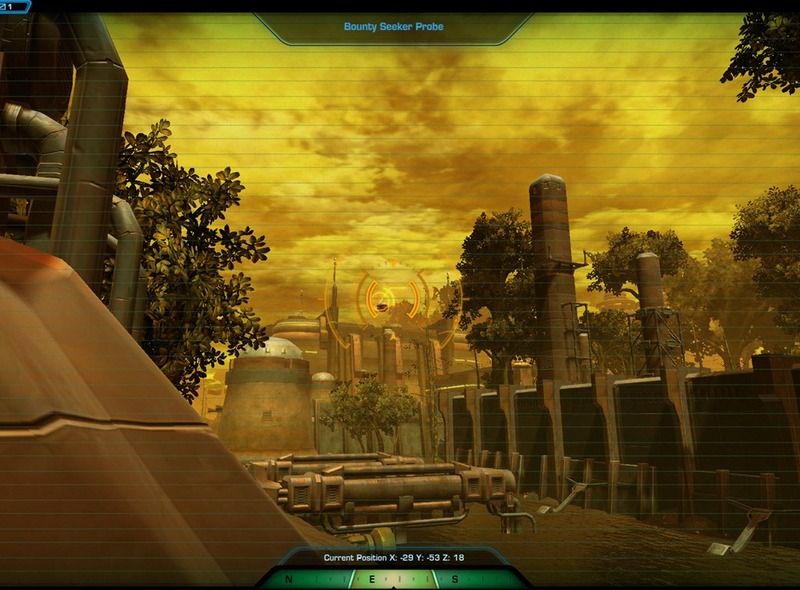 People are paying 80-100k for completed henchmen contracts on the fleet… I just don’t see the point for 3 lousy basic comms and a little rep you could get by doing the henchmen quests. 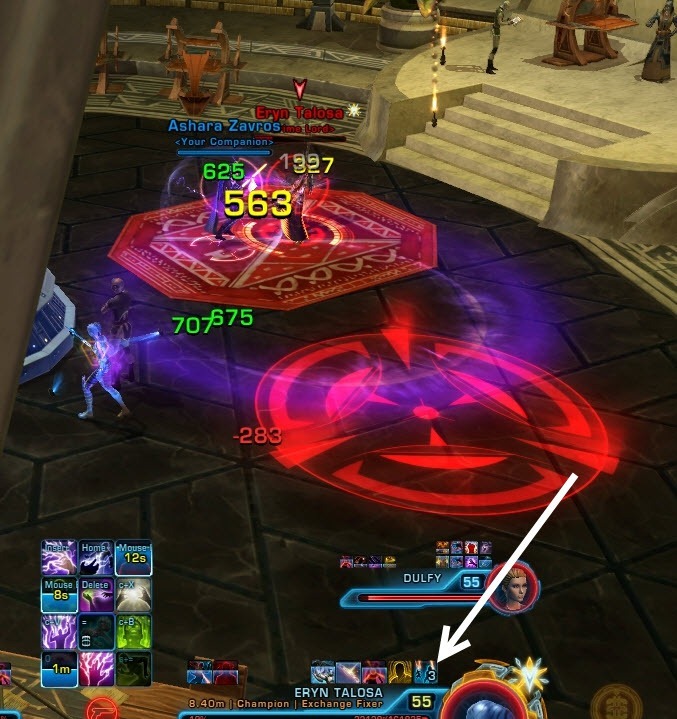 People are trying to up their rep to buy stuff from the event vendor…..I doubt people are farming them for the comms. 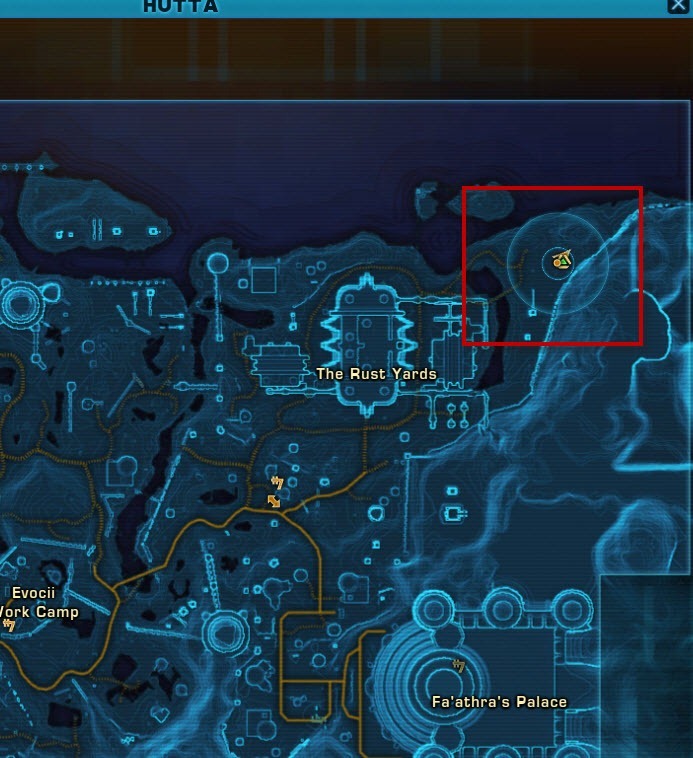 If you don’t like the vendor stuff, then the event probably isn’t for you. 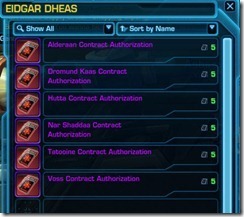 If you like the vendor stuff, then those are the people who are paying money for completed contracts. People are gathering Completed Contracts to unlock the Kingpin missions. The only reasonable reason is to unlock all even achievements this first week, plus banking the Rep tokens. 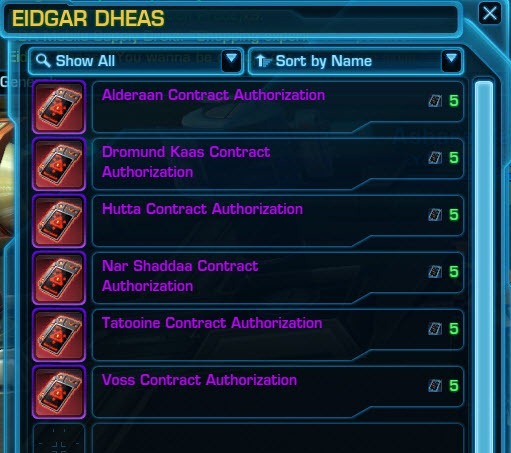 I’m doing the same, but I have 9 toons, so I can do it without having to resort to buying contracts. Basically, we’re ruining the future of this event for ourselves. 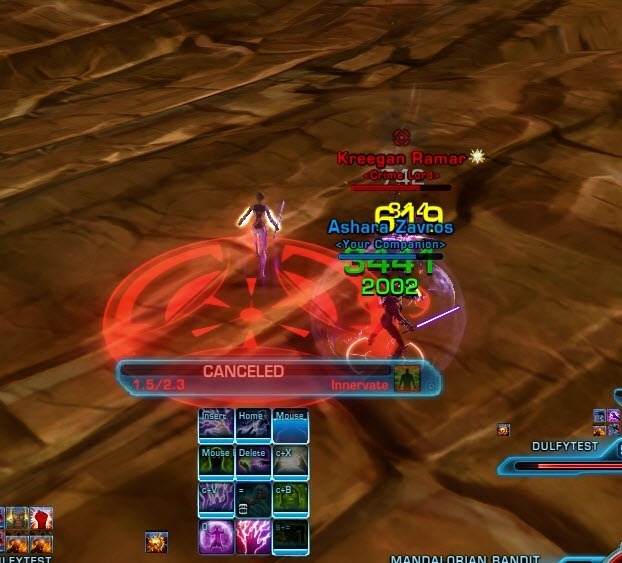 I was fighting Kreegan Ramar on Tatooine and had him down to 5% or so when a Republic bystander decided to “help”. 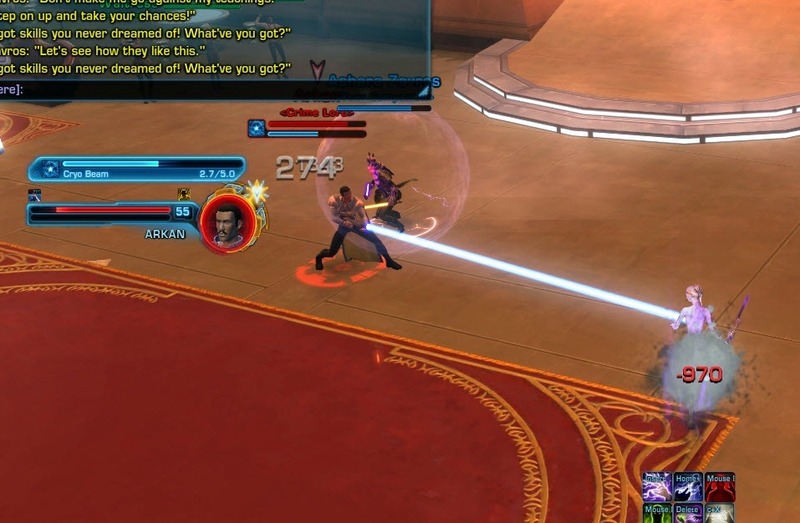 He started blasting away at the Kingpin while I was getting an add off of Mako. My “helper” got the killing shot, and the mission did not complete/move to the next phase. 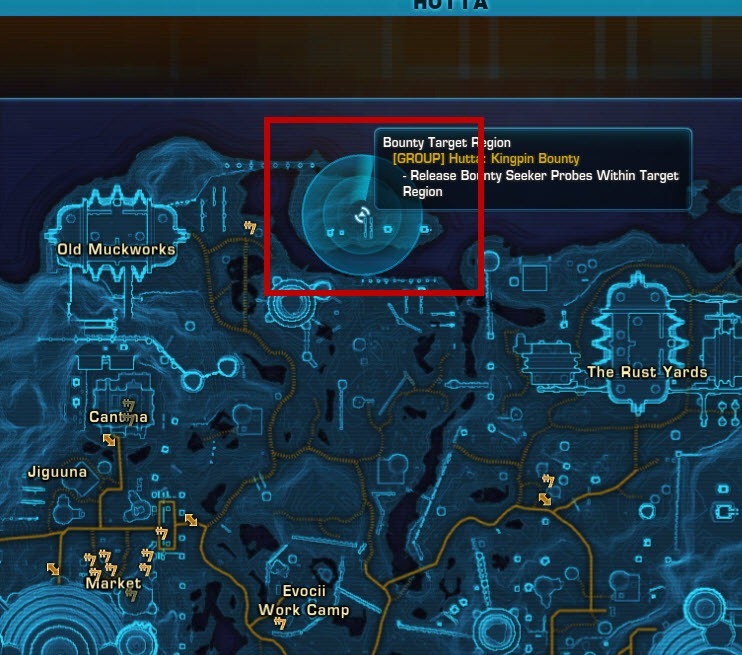 I heard this complaint from numerous people, that it’s very easy to lose your bounty target if someone else kills them. 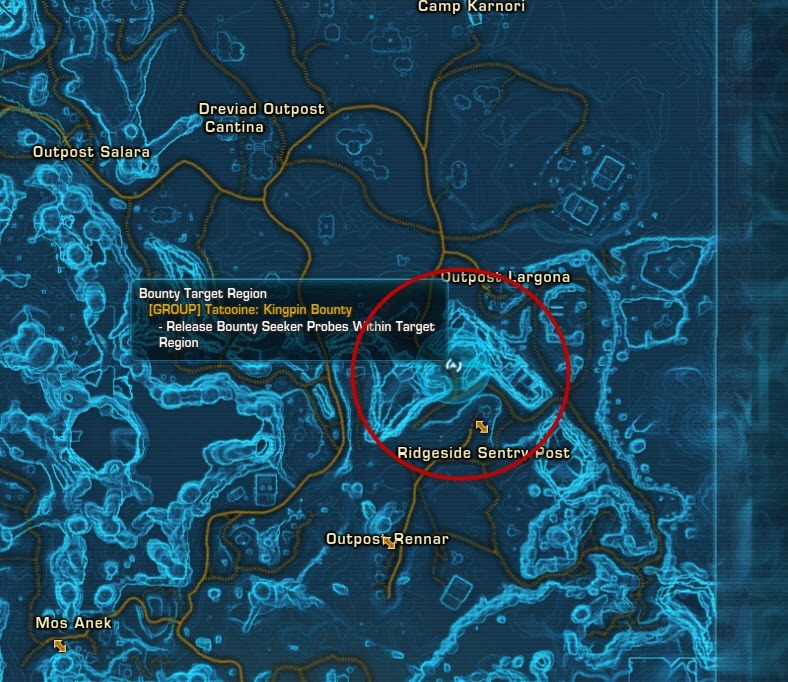 Hopefully they will fix this soon, it is a potential source of griefing and very annoying even if not intended. 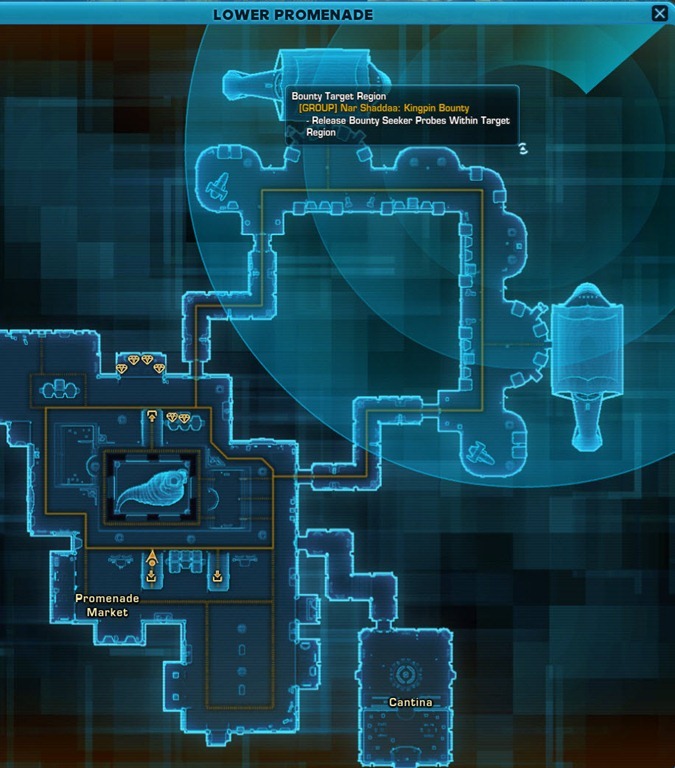 Do you get the macrobinoculars for the missions or do you have to be lvl 52 ? First i grouped up with someone who wanted to kill him to get that achievement, however when we got to kreegan i chose to CAPTURE him. 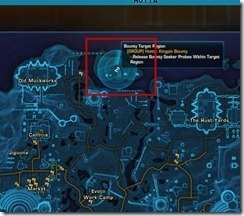 This forced my group mate to reset his quest and go talk to meekro all over again. 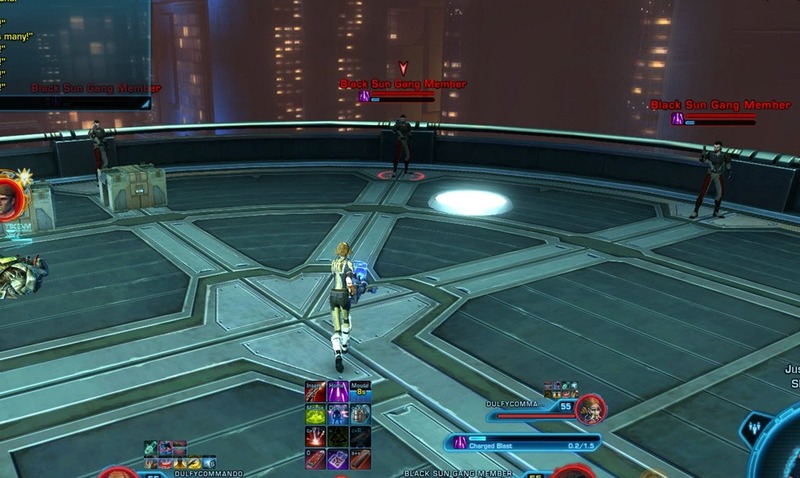 While my group mate did that i also went to talk to meekro to end the quest and give me the dialouge to go back to the fleet. 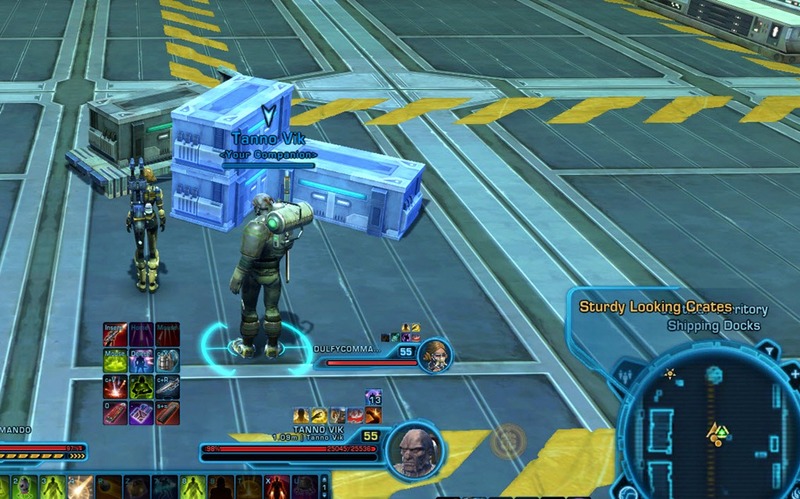 But since my group mate still needed me i went back and helped him KILL kreegan instead of going back to the fleet, however this time right when i killed kreegan i got the achievement for TAKING HIM ALIVE immediately. Then my quest told me to go talk to meekro again, but when i got to meekro i couldn’t talk to him and i could go to the fleet to turn in any more either, so i had to reset my quest too. 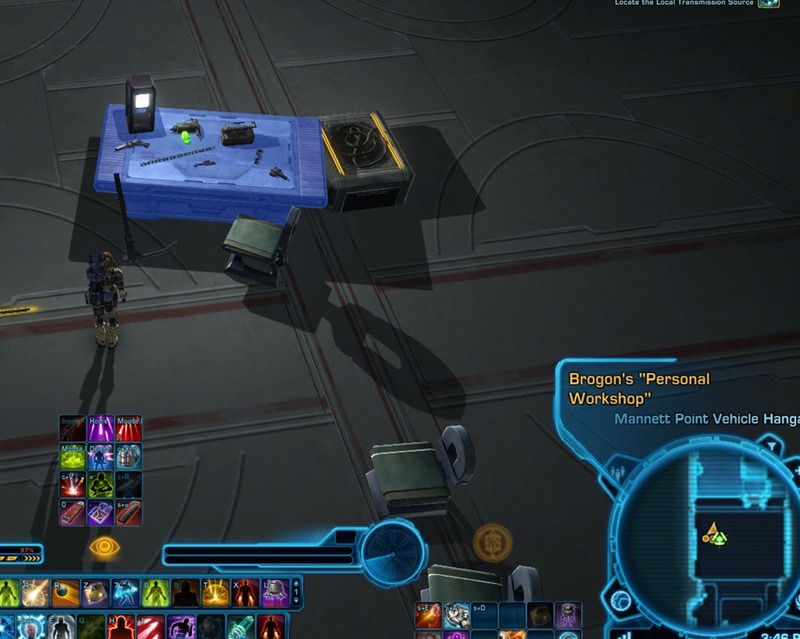 I then started over and this time i KILLED kreegan and when i got back to the fleet and turned in my quest i got the KILL achievement. odd bug, i think but now i wont have to go back to tatooine another day. 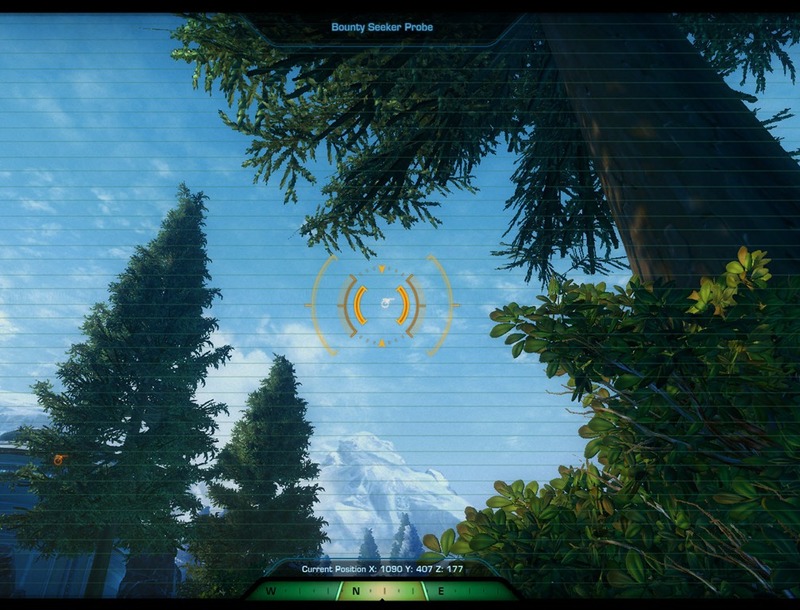 im gonna try it again for other planets too, as im sure it would work any where else as well. Be wary: Lots of people are having problems with the Kingpin missions bugging, since the “fix” patch yesterday. 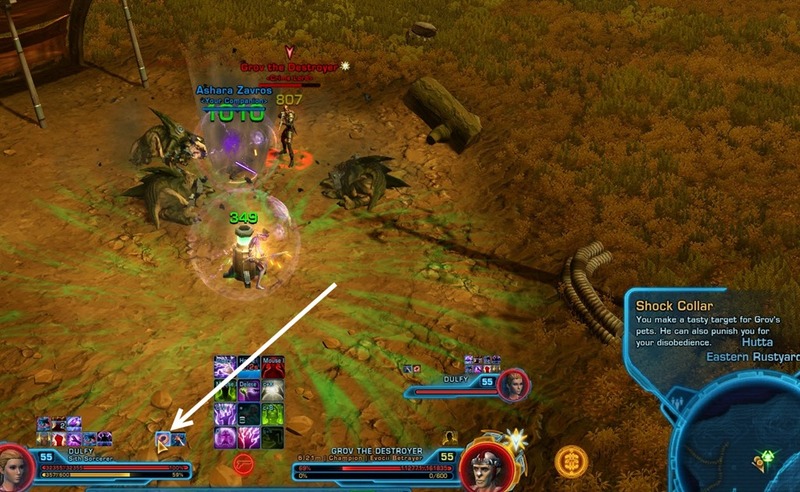 Saw it popping up on general chat a lot yesterday, then me and my guild mate had it happen to us. 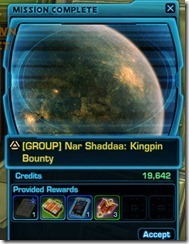 We had mailed 5 completed contracts to a toon and had them pick up a Kingpin mission, in our case on Nr Shaddaa. 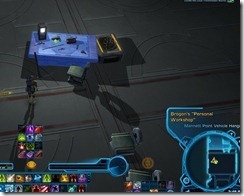 After right clicking on it, he begins to read the contract, you get the reputation item like you’re supposed to, but the mission never shows up in your mission log and all 5 contracts are spent. Went to Nar Shaddaa to be sure and after disembarking we both received an email from the Kingpin, as if we had completed the mission already. 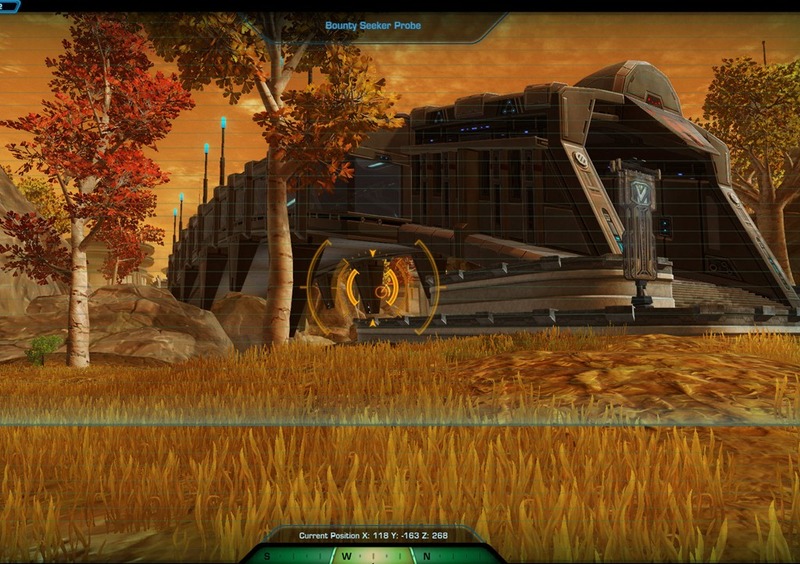 Went back to fleet, and of course there’s nothing to turn in, so now we’re both out of 5 completed contracts and wary to try another Kingpin mission for fear of losing another batch of completed missions. Put in several tickets in-game and customer service forum, all of which, unsurprisingly, have gone unresponded to. that happened to me on tatooine. of course i had the henchmen bounty active as well on the same planet. 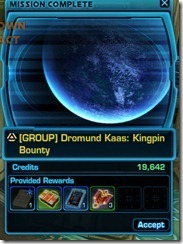 i think the fix is to not have any henchmen bounties in your quest log at all. 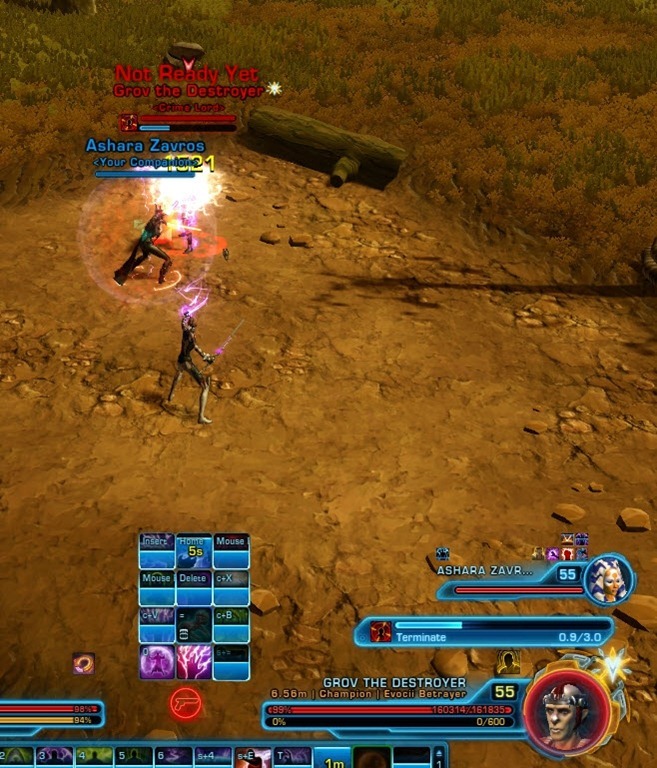 Neither of us had any henchman bounties active. Moises has the right answer. 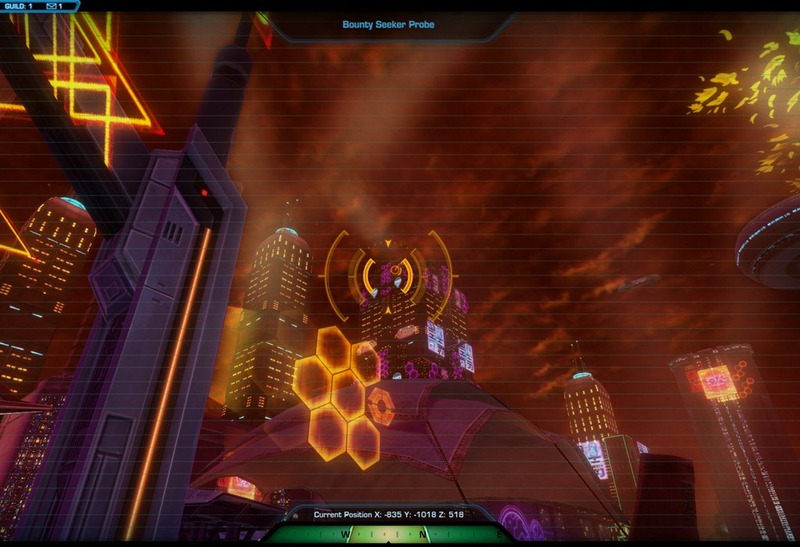 You pick the bounty up at the terminal after it does that. 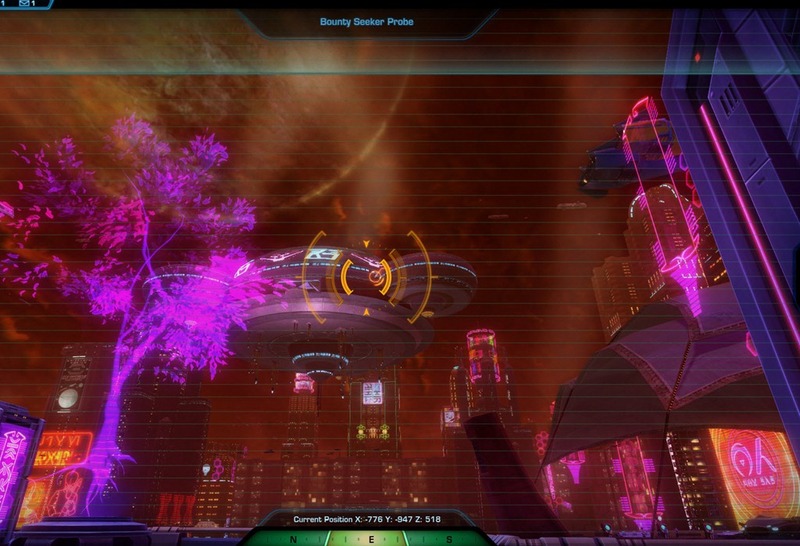 Arkan (Nar Shaddaa) has around 20khp at level 20. 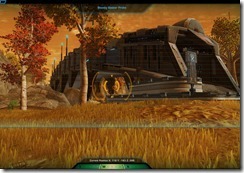 Soloable as a level 20 Powertech in rating 50 gear. So maybe a silly question… I unlocked and completed a kingpin yest. Today I do not have the option to do it. Do I have to pay 5 to get to do it again or will it unlock some time in the future? 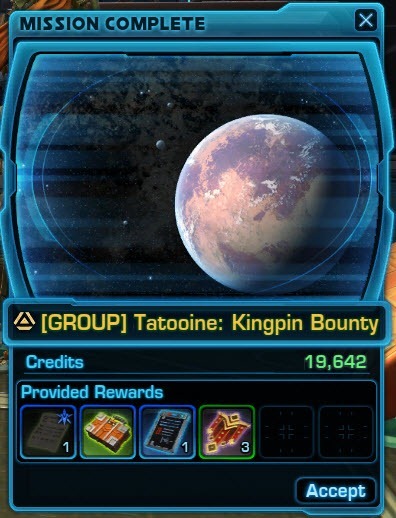 They changed it to weekly per specific kingpin bounty contract per character now I think but give purple reps. So many stupid restrictions on this event. re Arkan- At L40 and 45 he was a real pain to beat. 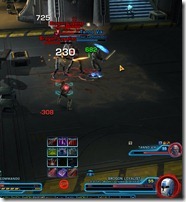 His attacks cant be interrupted, and he does a lot of damage even on a Powertech tank. 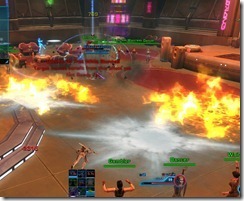 What finally worked for me was to break LOS on his attacks (cryo, auto, heat, powershot) to minimise the damage I took. then my comp could keep up the heals. 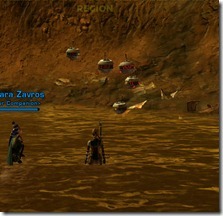 and provided I kept my comp out of fire mines, I finally go through it. 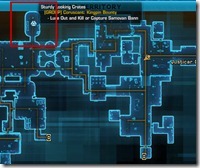 Out of curiosity, is there a point to doing these if you have max rep with bounty brokers? I’ve never done a kingpin and thought they might drop better loot or something but after reading this it seems they just drop rep items. 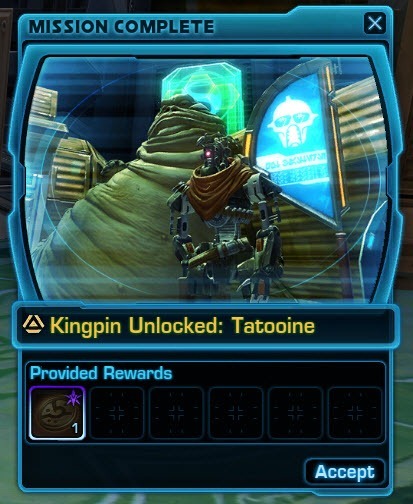 I guess I pretty much answered my question, no, they’re not worth doing if you’re max rep.
i cant go ahead more in kingpin of tatooine. 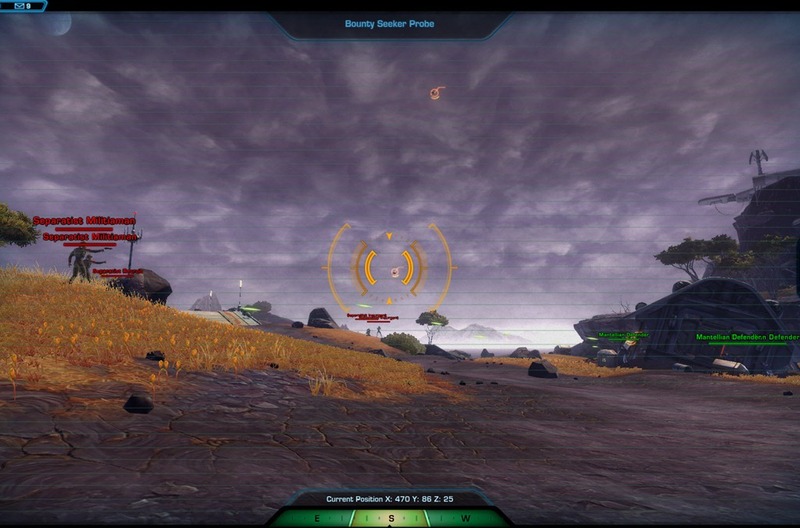 seeker probes arent active even im staying at exact point. 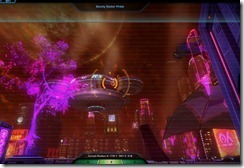 mission terminal but I do not see it available for the other toon. 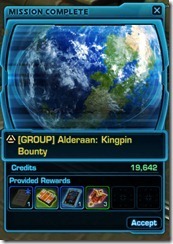 when the event is on hold can you still do the kingpin missions or do you have to wait for it to come round again? sry noob alert, do all members of a kingpin group need to have 5 contracts or is it just the group leader? All members need to give in 5 contracts for them each to get credit and I believe you all would need to take turns. 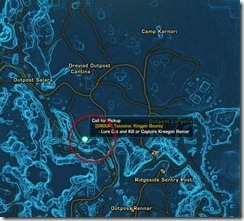 Only 1 person gets credit for each kill/capture. 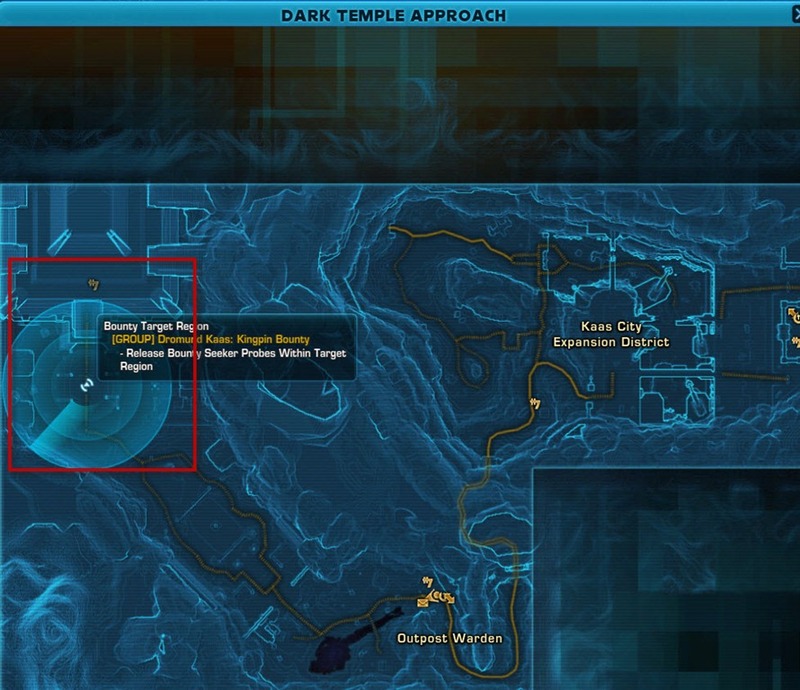 Maybe you can explicitly say that after unlocking the Kingpin Bounties you need to pick them up from the terminal. I was confused for a while. 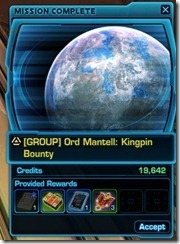 If you do Kingpin missions are the rewards like the gear you get different? 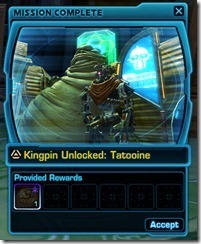 What and where do you turn in the kingpin certificates?? I’m not convinced these are soloable. 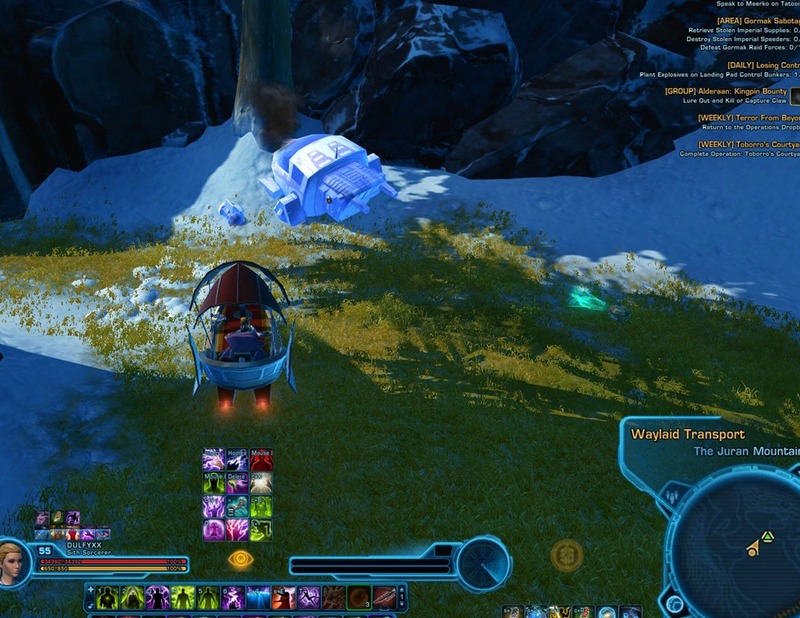 At level 60, I have all the Ziost reward gear, and my healer companion has a full set from Yavin IV, and I still can’t manage it. some are much tougher than others. i know the Claw one from Alderaan is very tough(but im also a Sage Healer) but the one on Ord Mantell was very easy. These are level sync’ed now. Last time I took on a Kingpin, it took 3 of us to do it. I just solo’ed it without any issue. Went down during the first wave of adds even. I don’t say that to brag. Just pointing it out. Look at all this you must do for tiny rewards. Their Marketing Department must think this Bounty Hunter Role Play is so good that we won’t notice the rewards are crap. 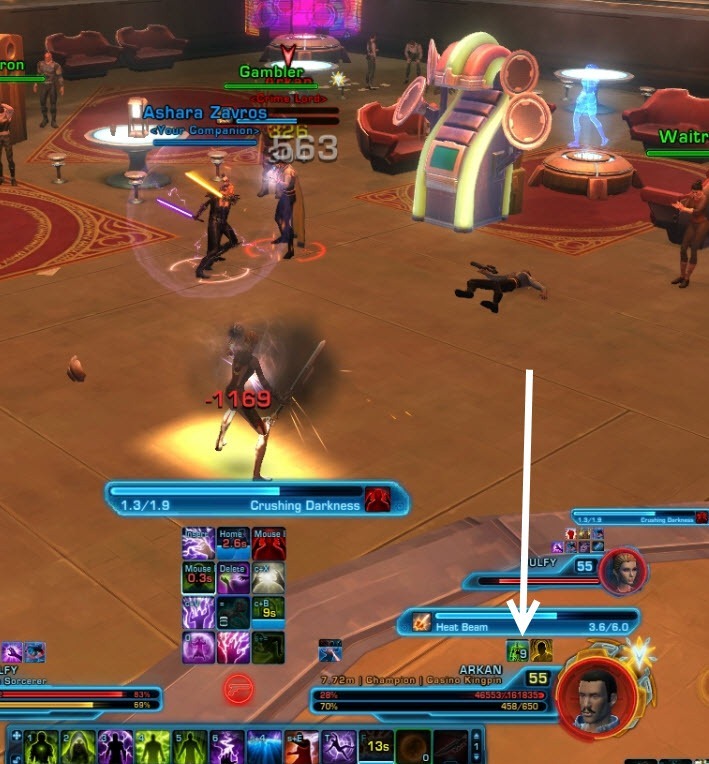 That’s why you see most Bounty Hunters doing this event. 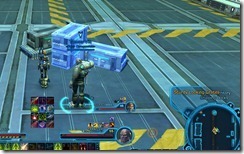 It’s entertaining to Bounty Hunters, but not profitable to anyone. Noted on my achievement todo list in the correct priority, near the bottom. 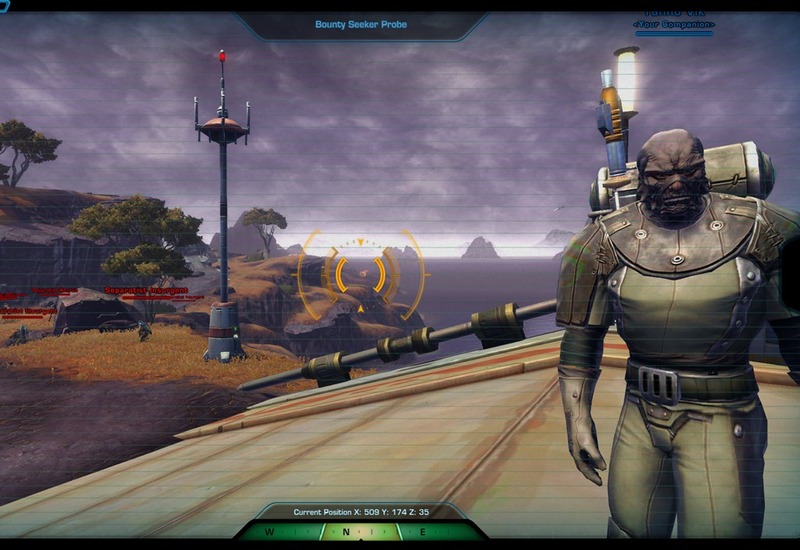 My main being a Bounty Hunter. I guess I am not into role play all that much. 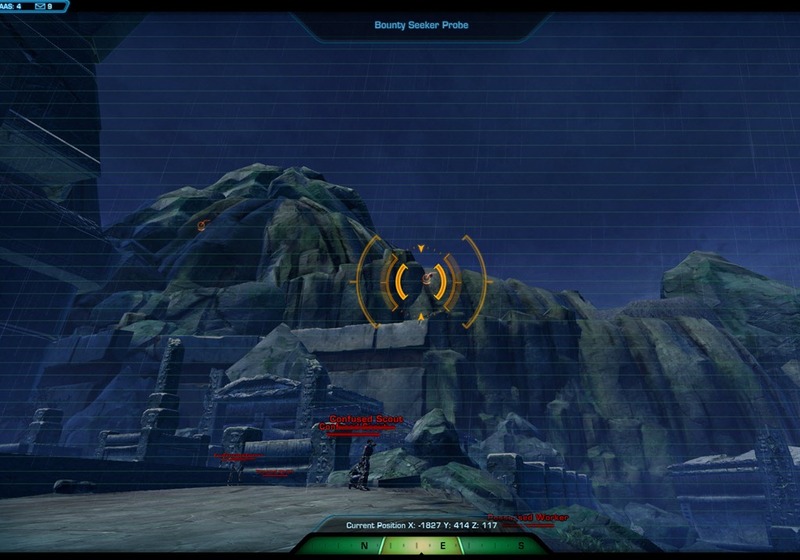 Could be why I am playing on a PvE server I guess, you think? I was able to refund the kingpin authorization after completing it, is that normal? I’ve seen the ‘weekly’ appear as a quest under the list of the daily ones, without needing to buy the item, i’ve seen it twice on the same day on 2 different characters, and other character, doesn’t show up, all lvl 65/ no idea why ?